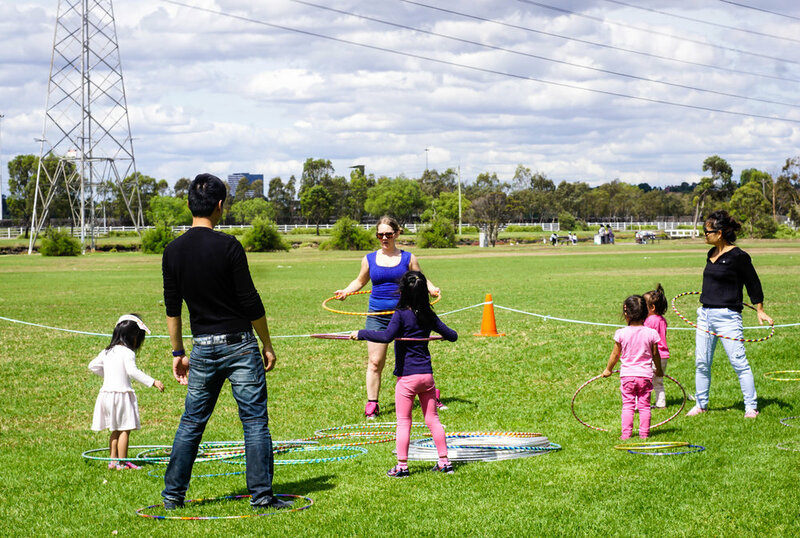 Together with Wynter Projects we co-produced a family-friendly picnic in Footscray Park to celebrate Christmas for the City of Maribyrnong. 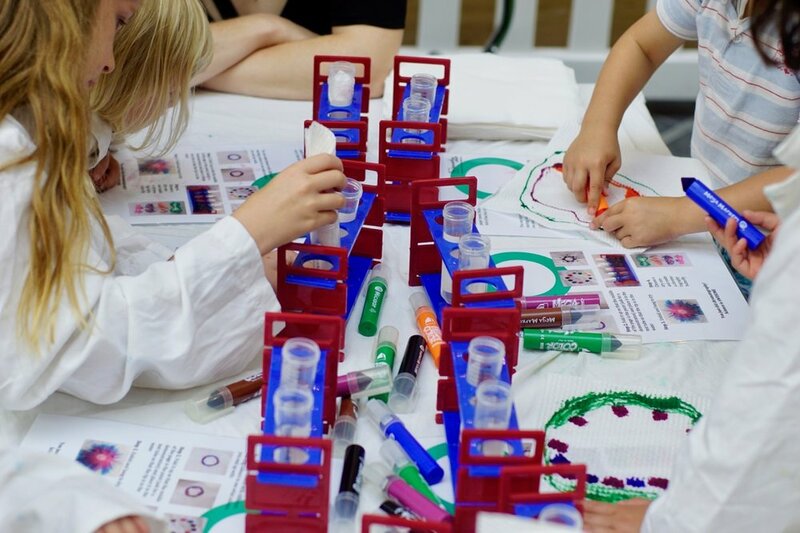 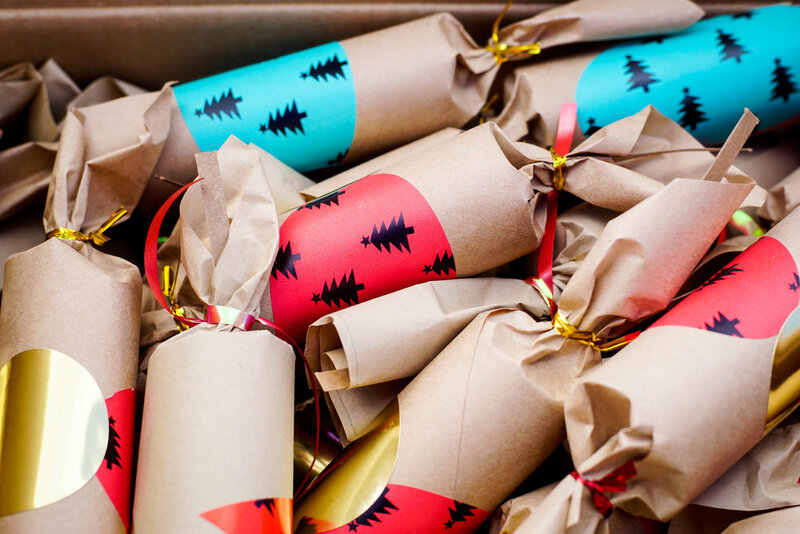 We handmade 500 Christmas crackers using recycled materials, each containing a special message from Santa inside. 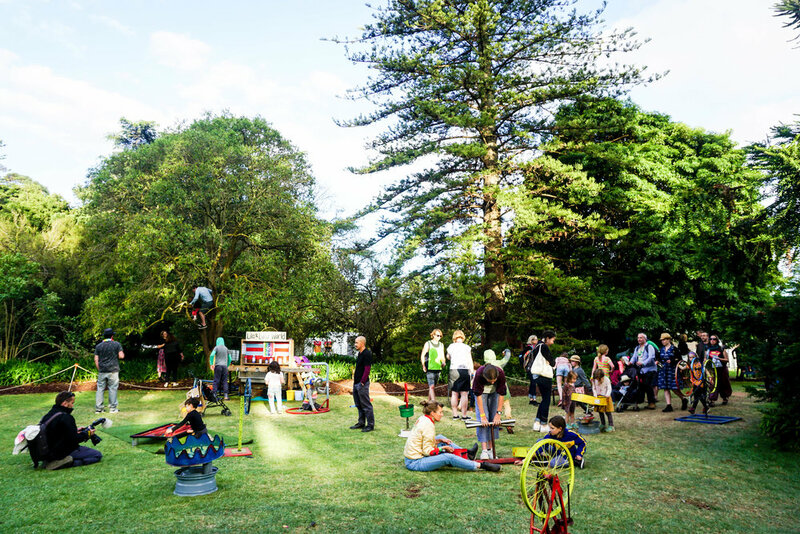 The crackers were then spread throughout the gardens for a mega Christmas cracker hunt for children. 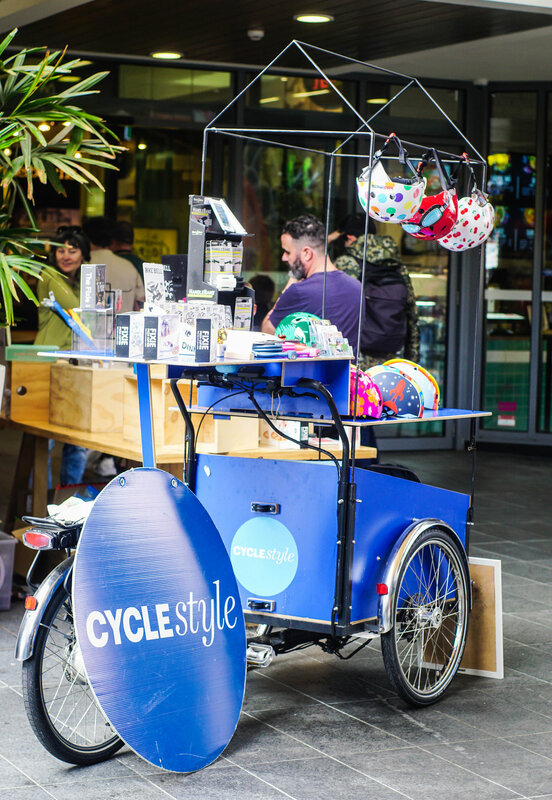 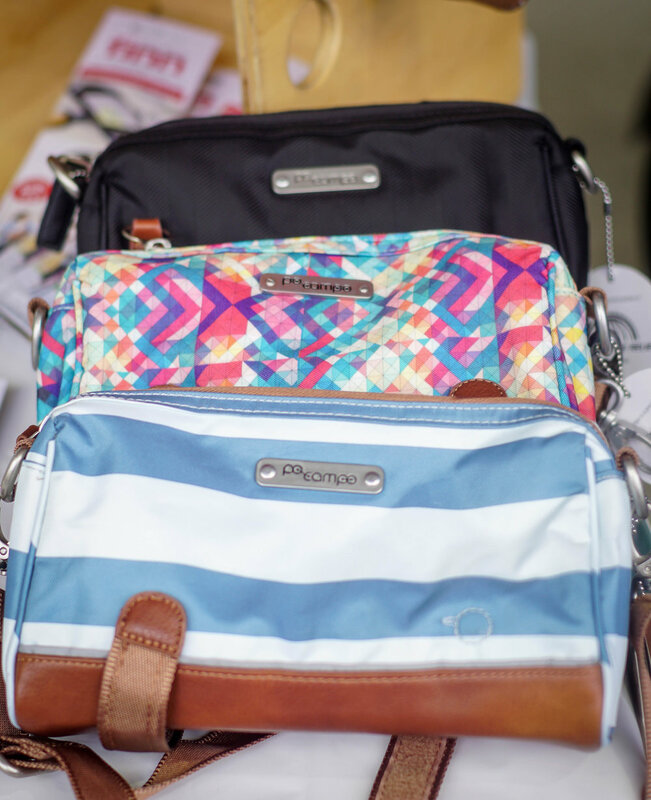 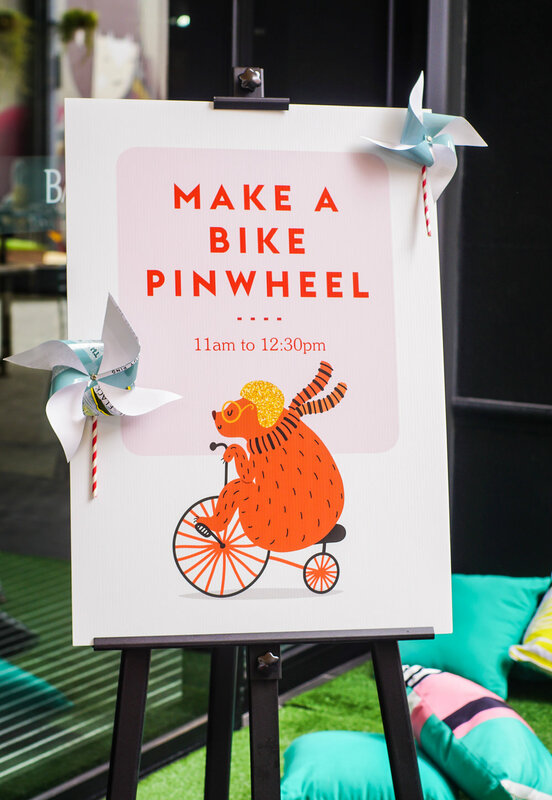 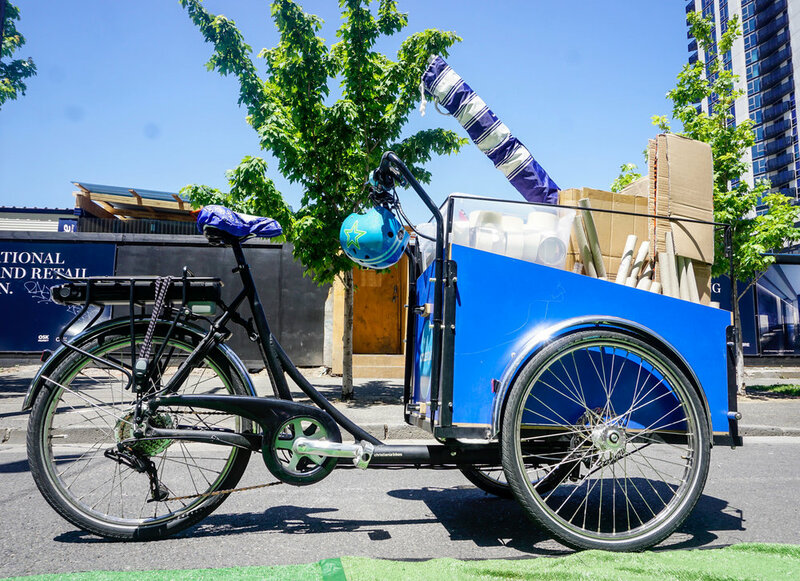 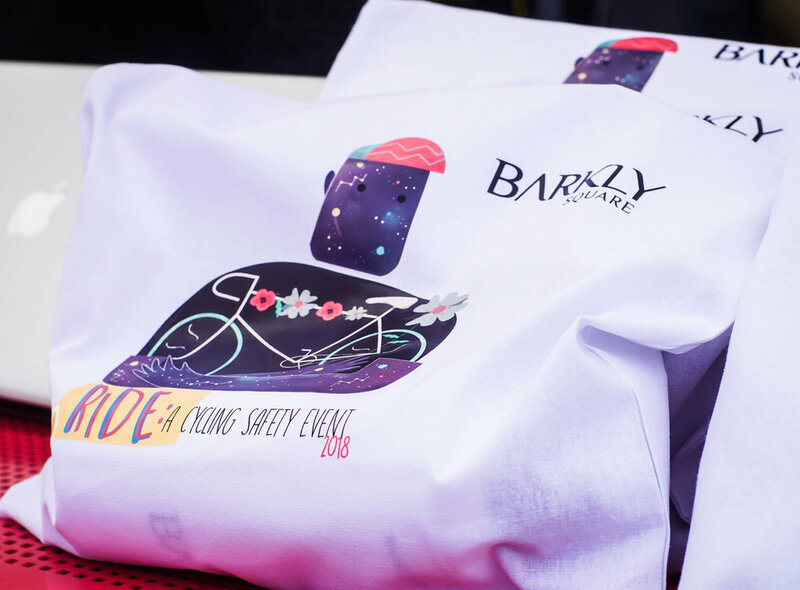 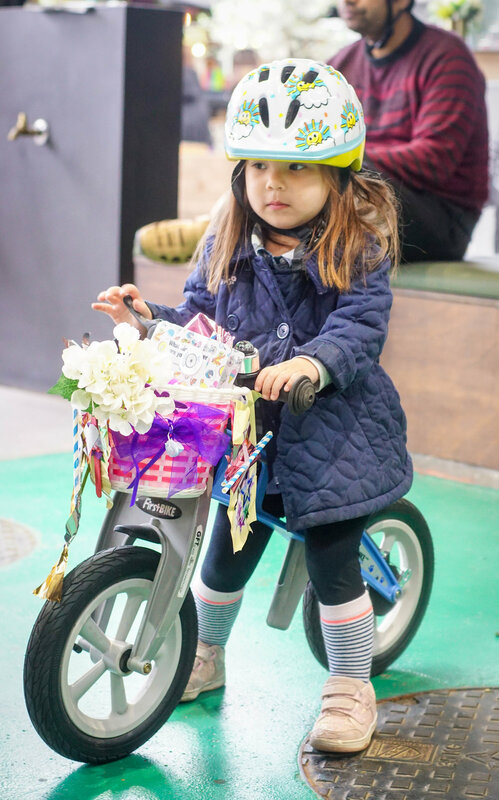 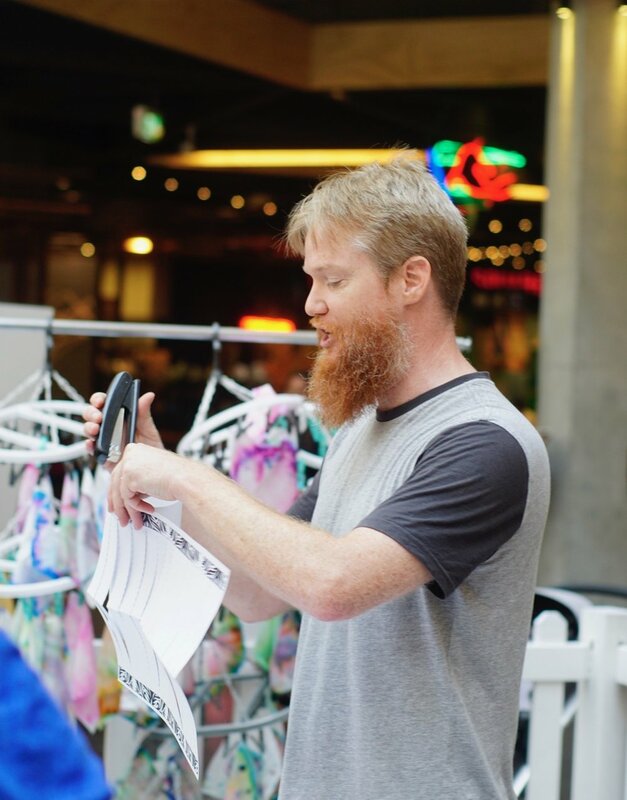 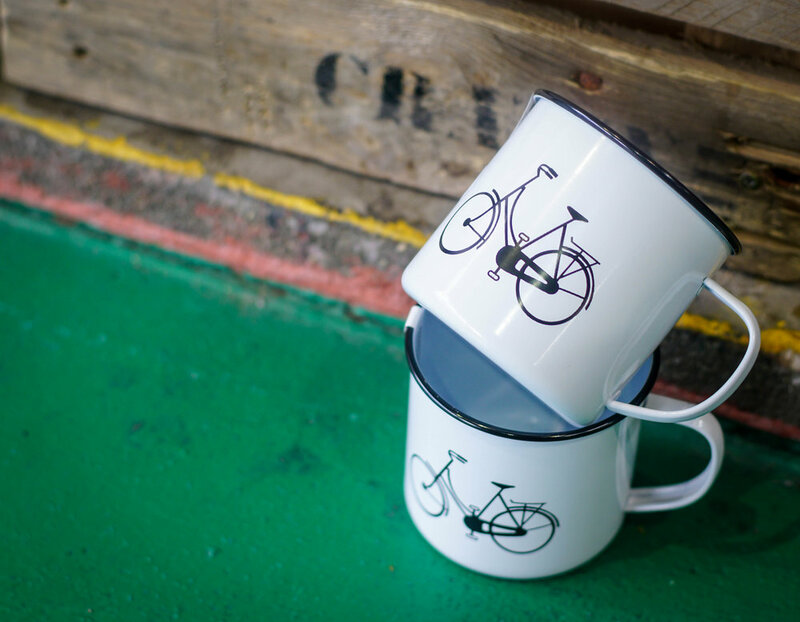 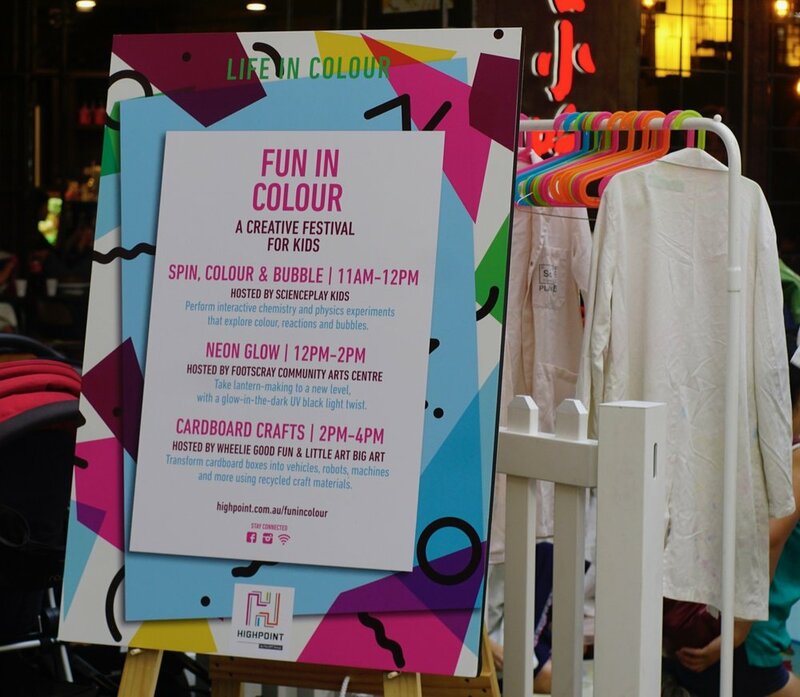 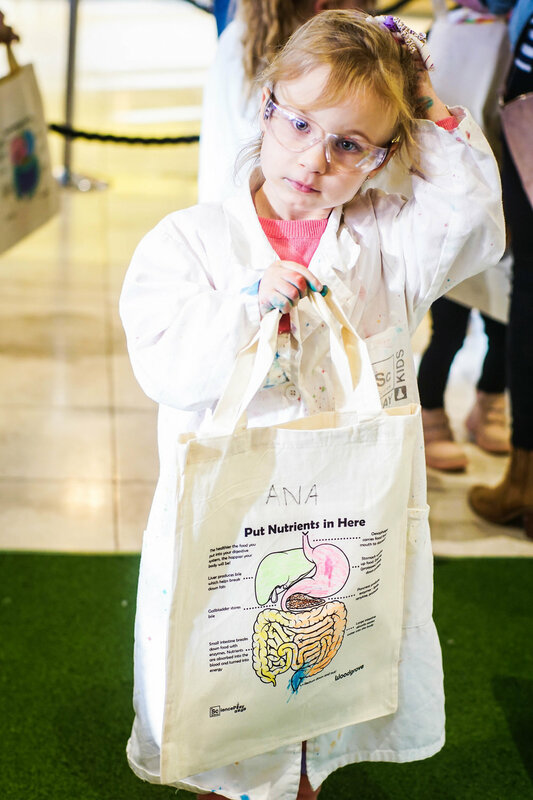 We also managed and coordinated all the artists and suppliers, including an acoustic musician, hula hooping workshops, face painters, Santa appearance, Christmas-themed craft, yard games, Rolling Scoops ice cream bike and Cobb Lane cargo bike of sweet treats. 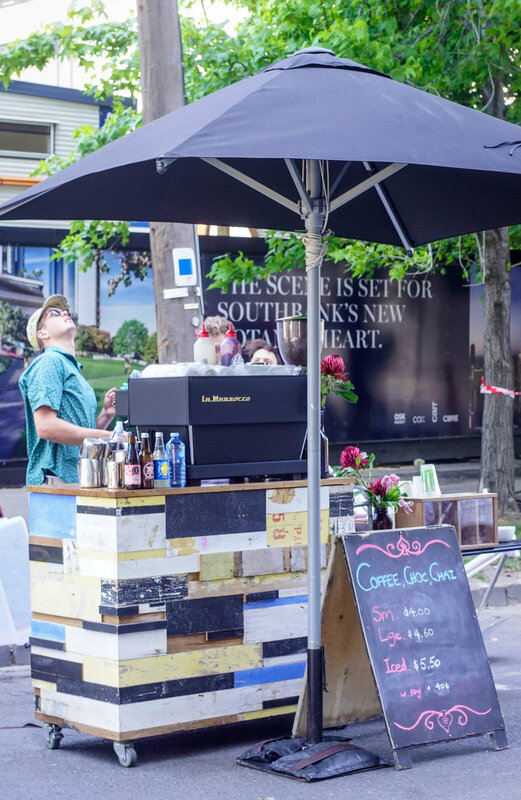 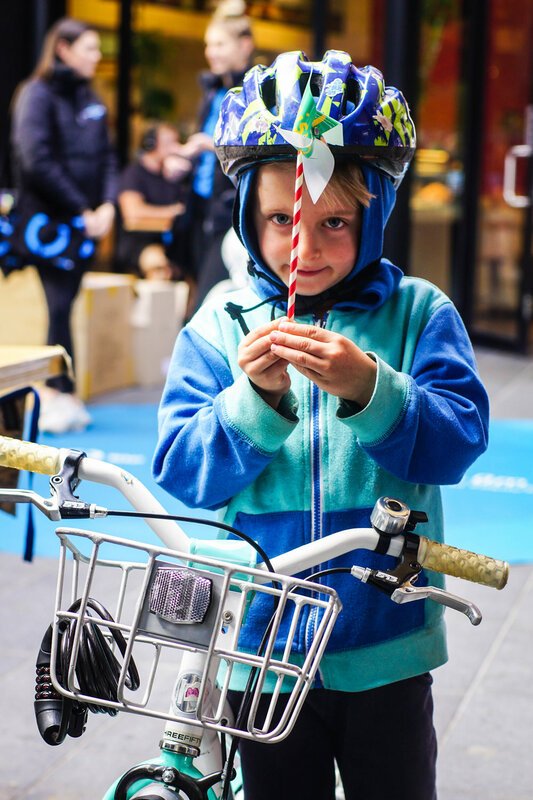 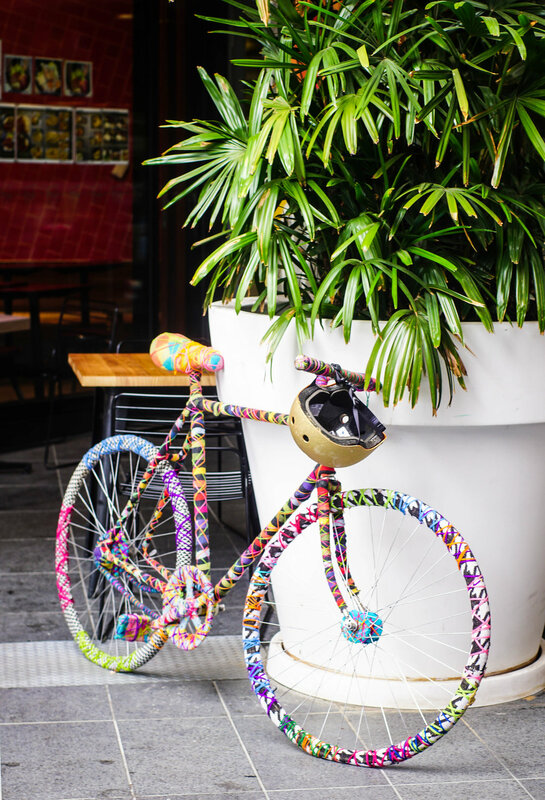 Sunday Streets is a City of Melbourne initiative to bring local neighbourhoods together and to create opportunities for neighbours to meet. 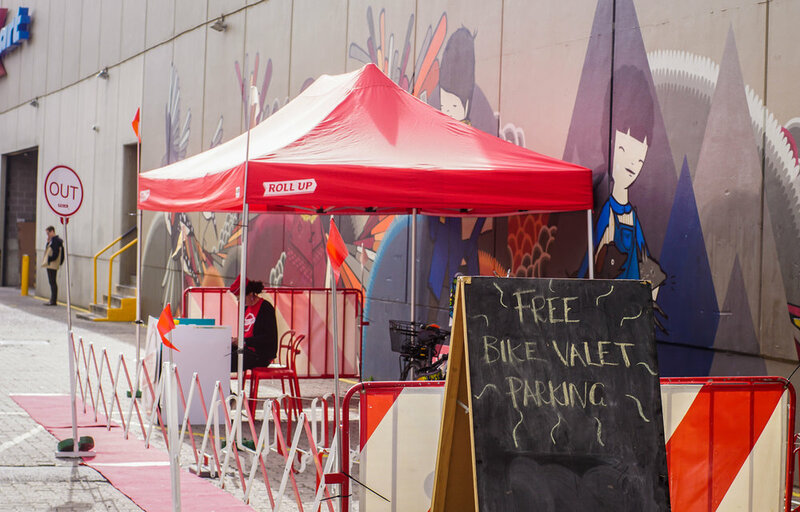 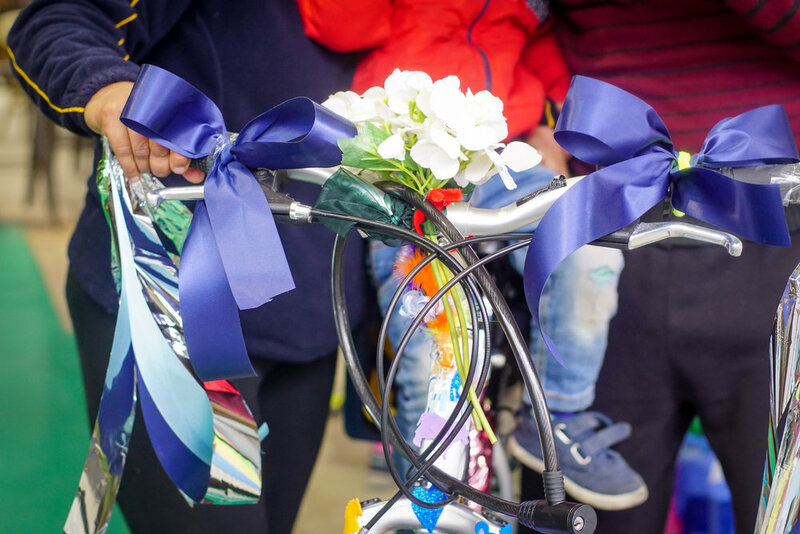 After a successful trial in Docklands the first official Sunday Streets event was held at Boyd Community Hub. 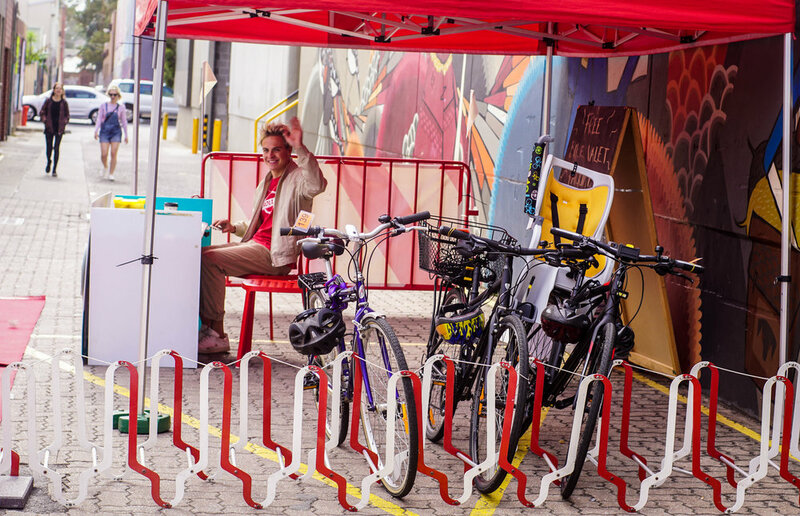 The street between Balson St and 100 Kavanagh St was closed to traffic, with various activations occuring on the day. 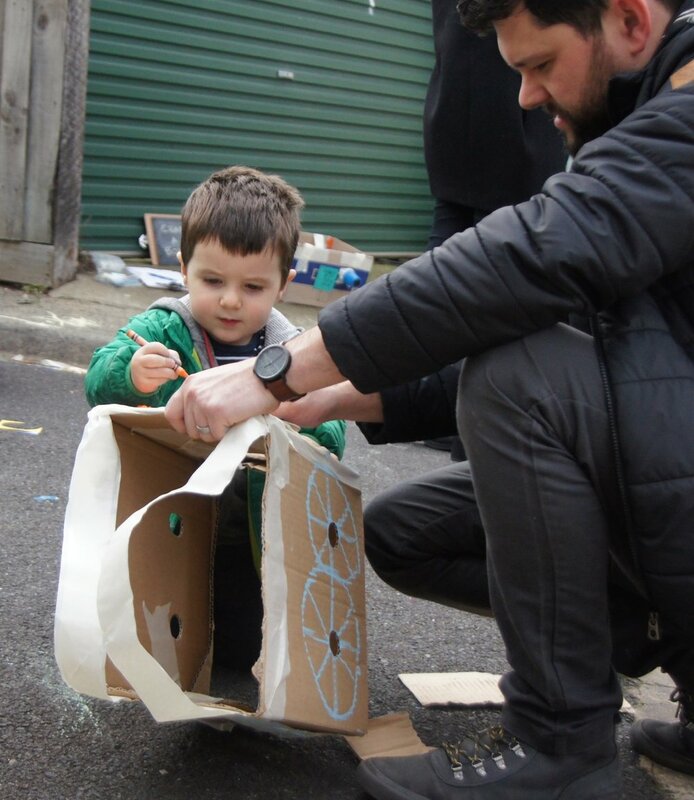 We facilitated a free construction play event where families were invited to transform a cardboard box into a city vehicle (for instance, a fire truck, postal van, ambulance etc) and then to take it out on the street to race their neighbours. 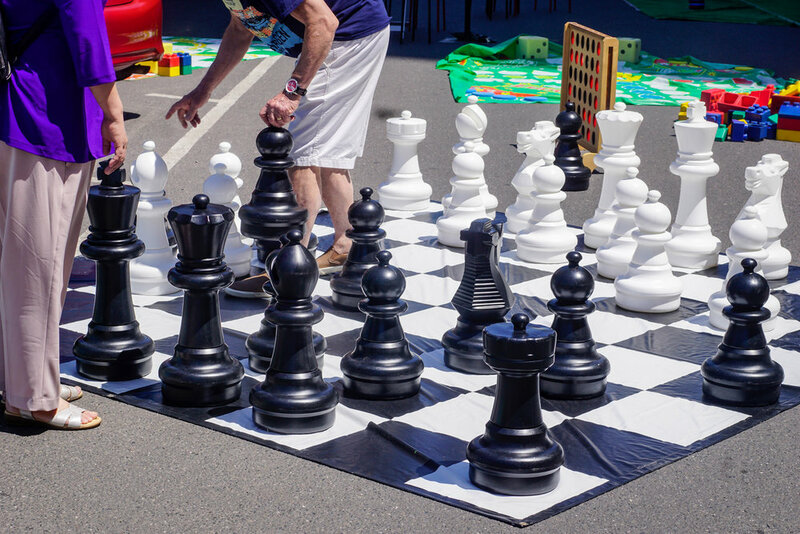 It was their chance to reclaim busy traffic thoroughfare City Road into OUR City Road! 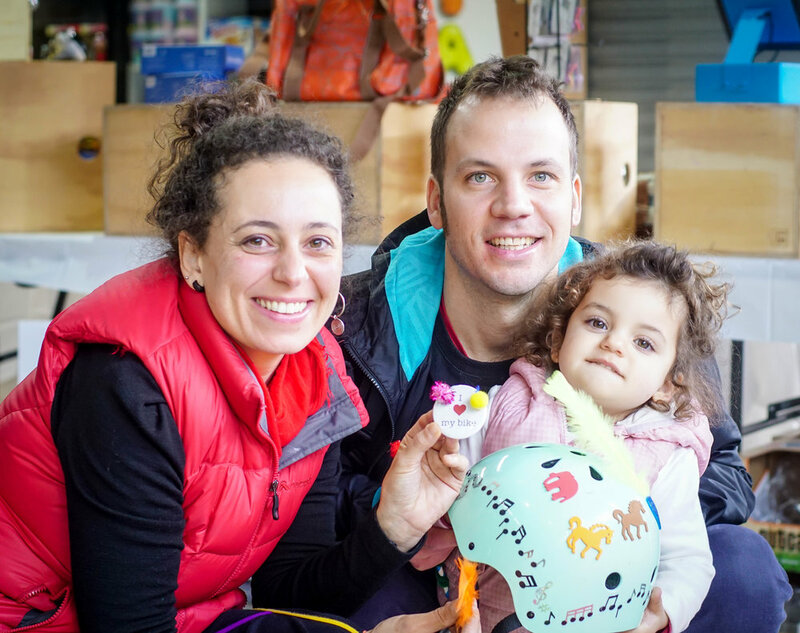 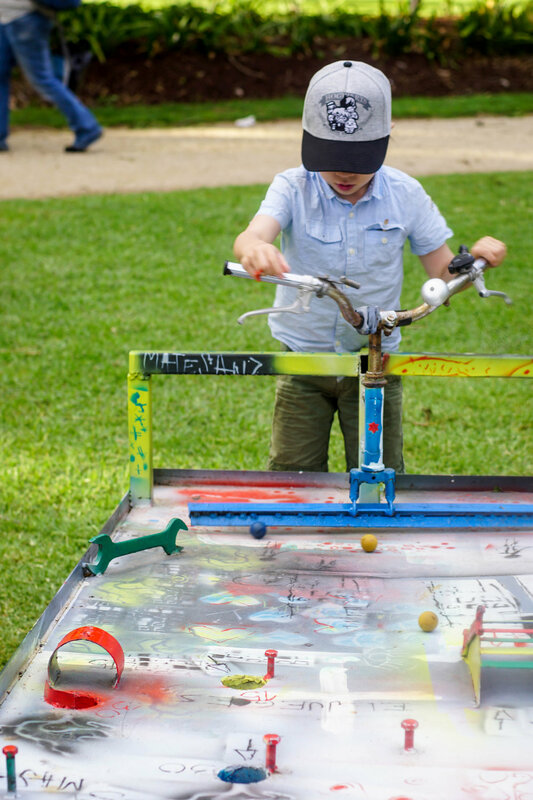 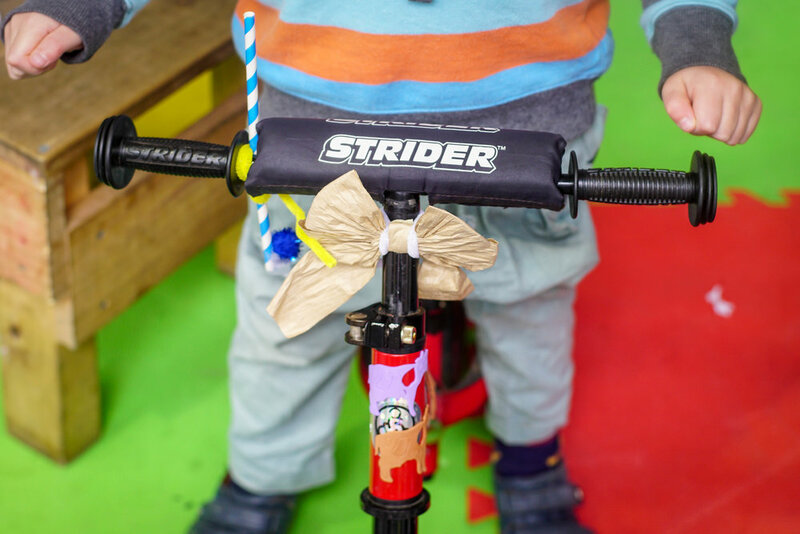 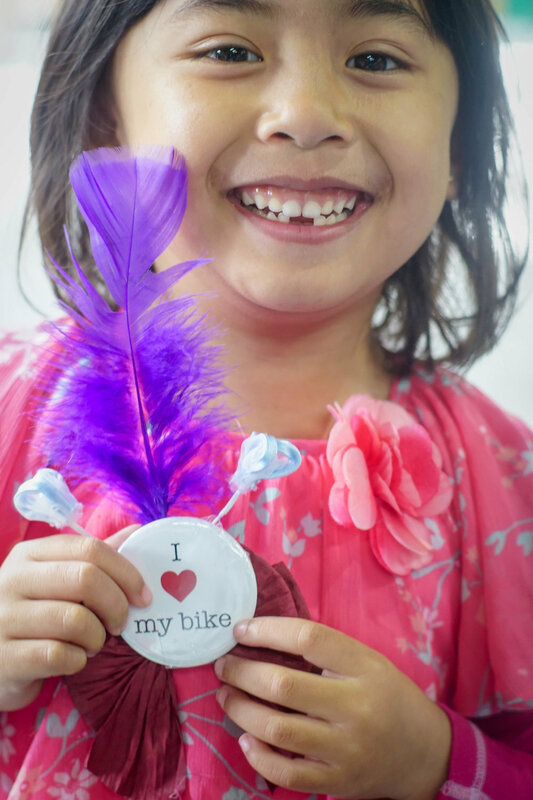 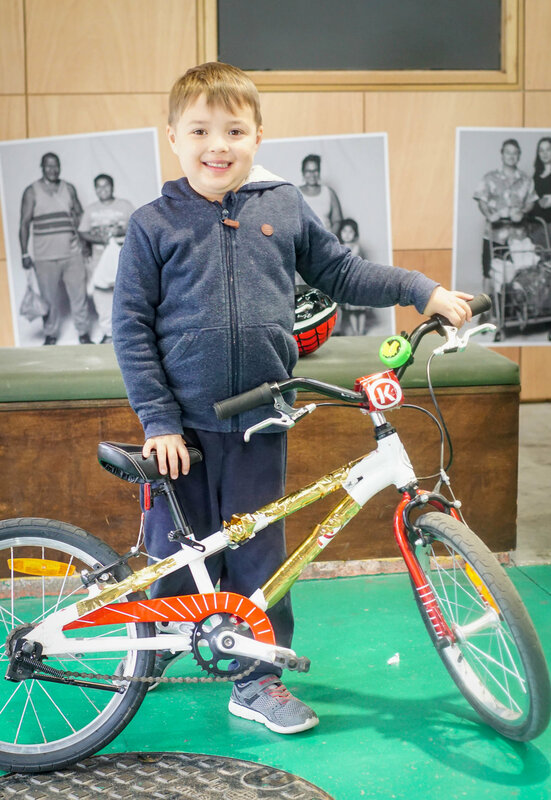 The Kite Bike was a free, facilitated, craft making event suitable for children aged 2+ years as part of a school holiday activation at Commonwealth Reserve, Williamstown. 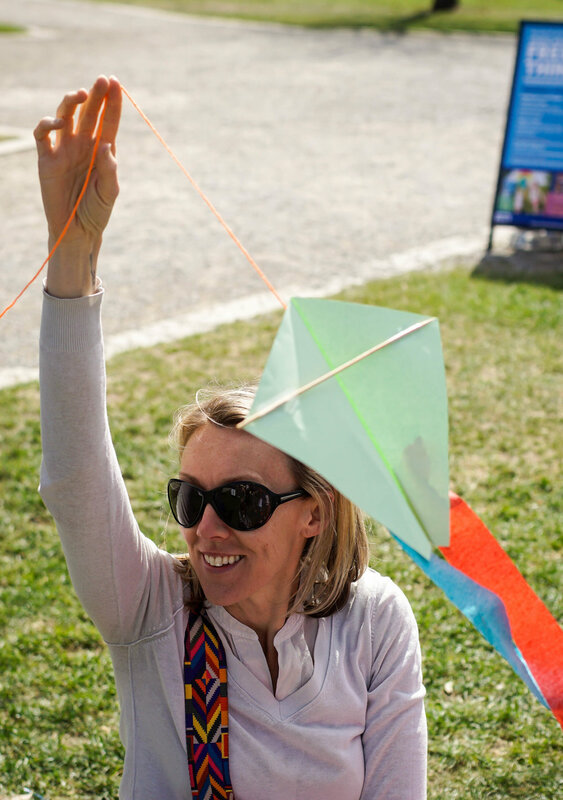 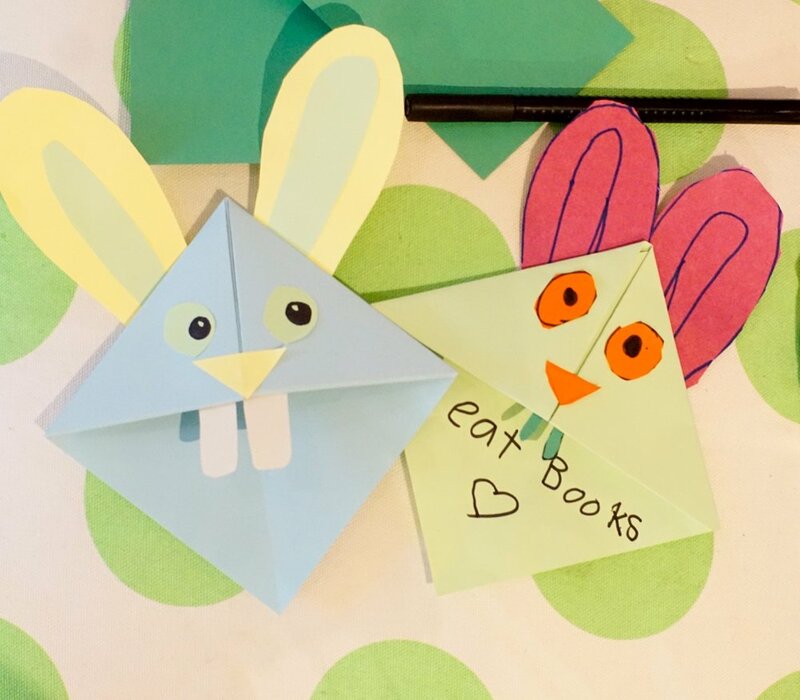 Kids were shown how to fold a simple easy-to-fly paper kite using paper. 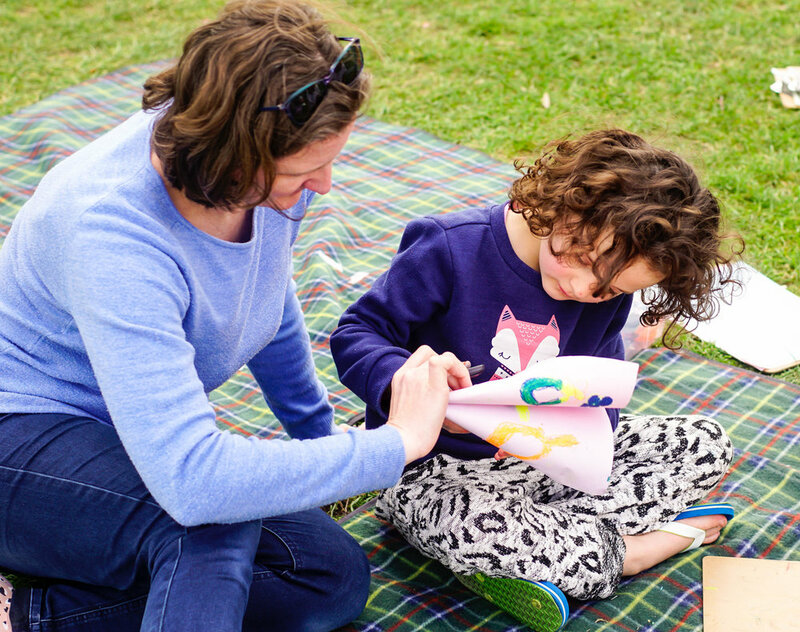 They were also invited to decorate their kite with drawings and to add a colourful tail and streamers. 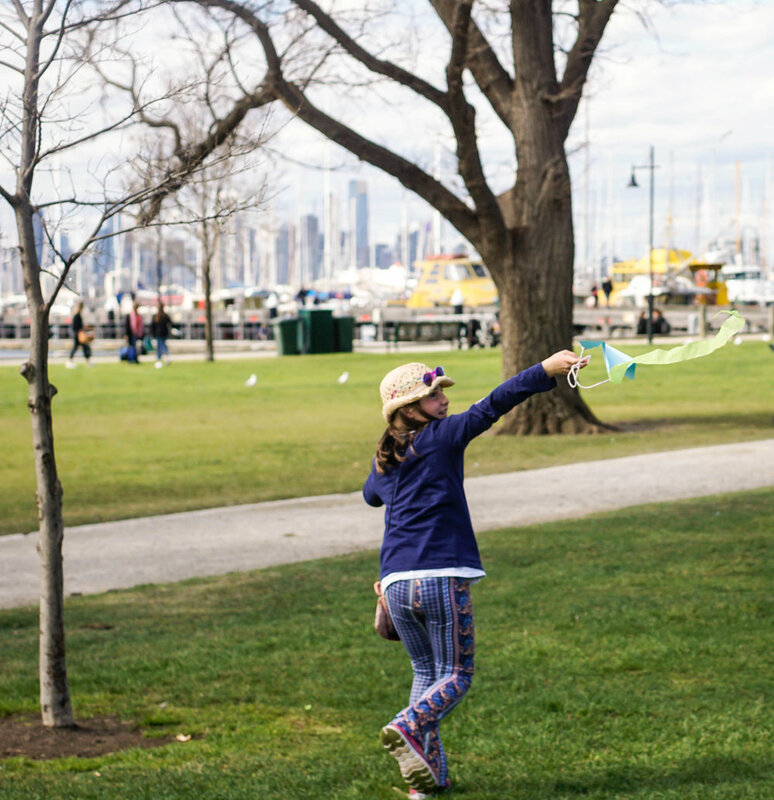 Then it was time to RUN so that they could watch their kite travel across the sky! 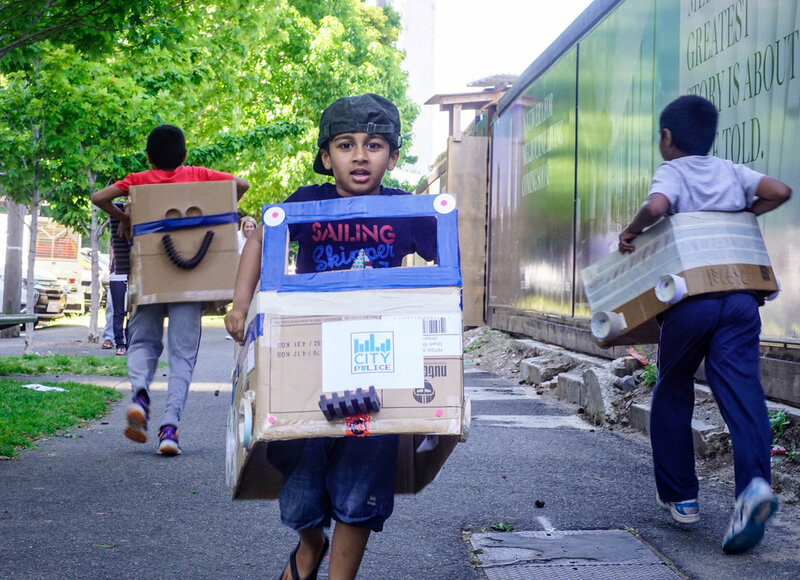 All aboard for the boat race! 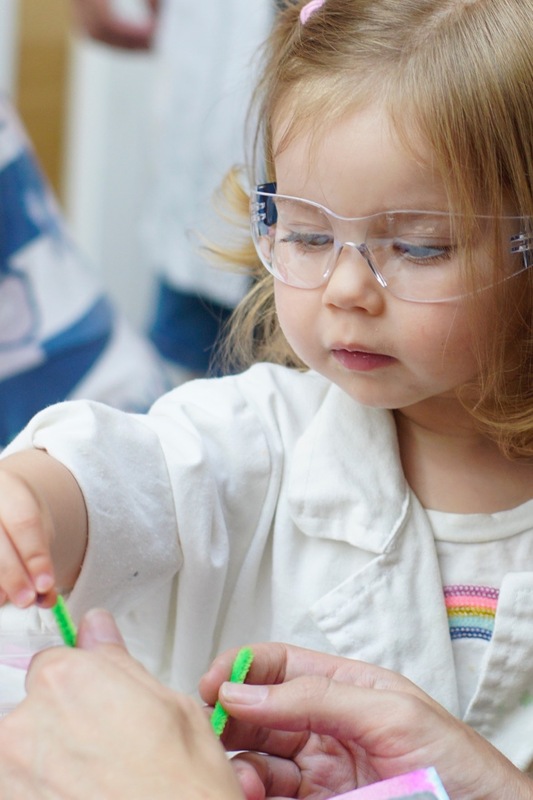 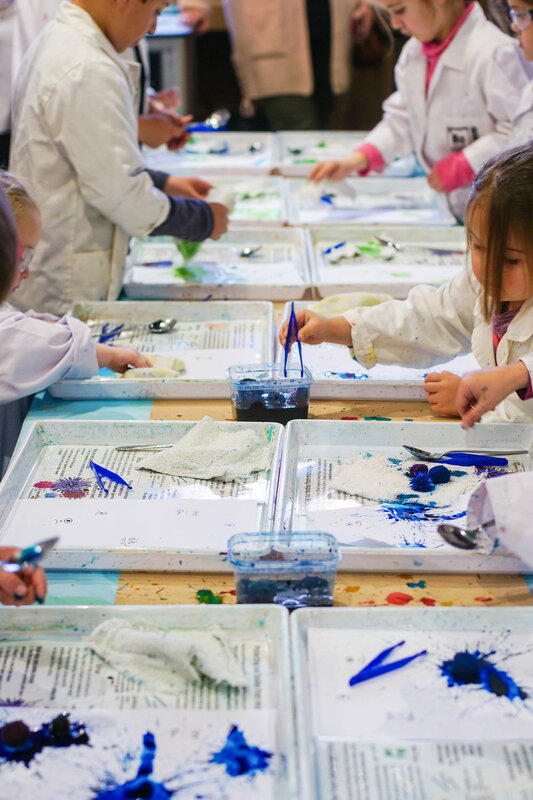 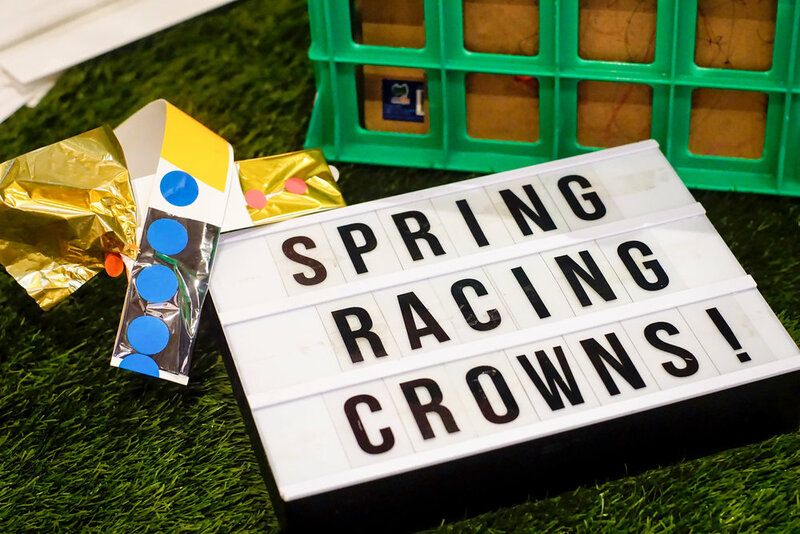 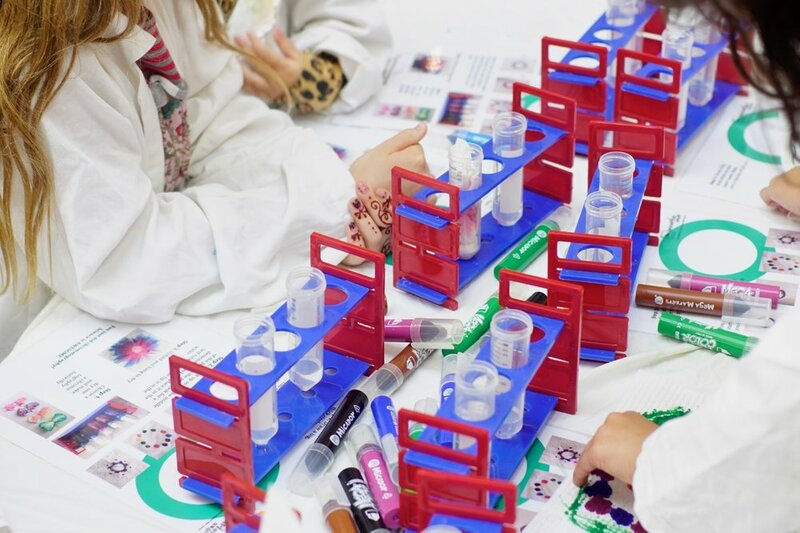 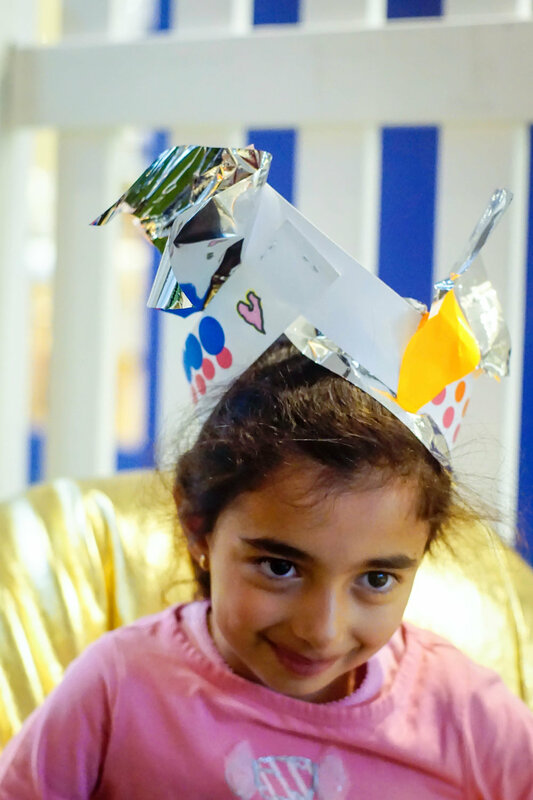 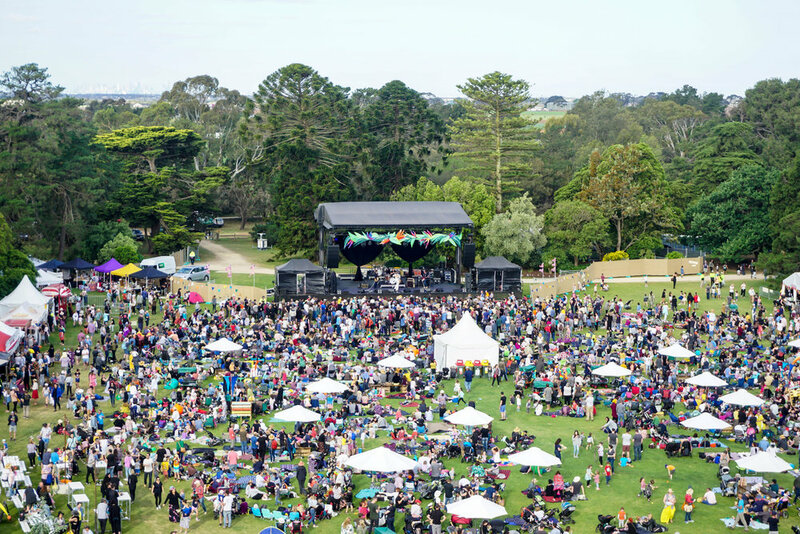 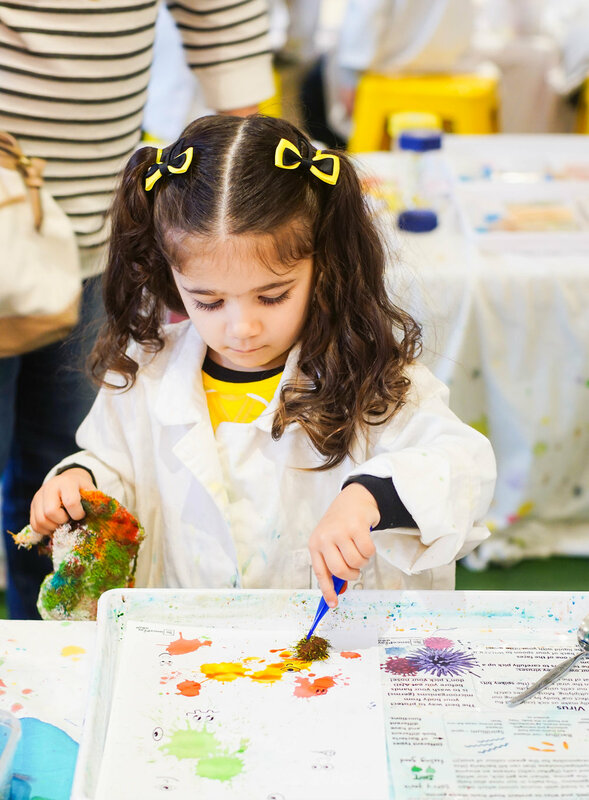 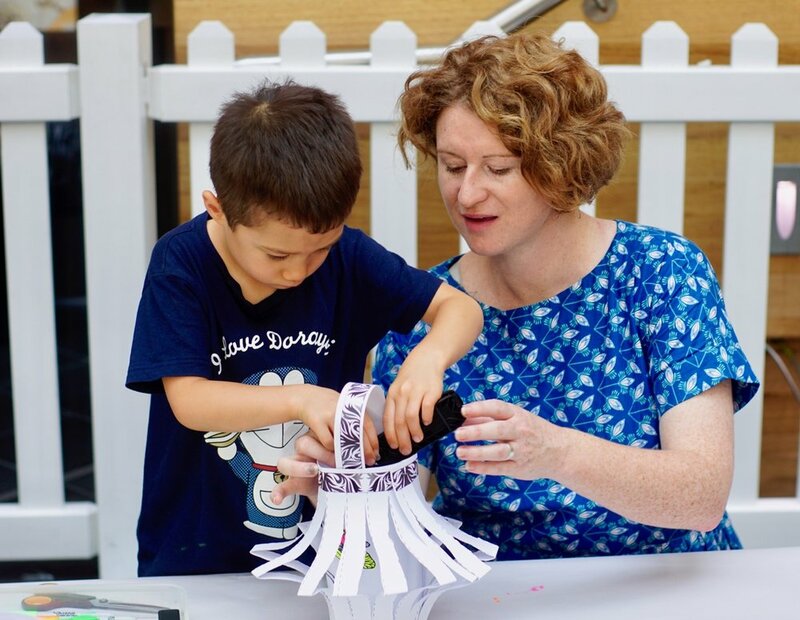 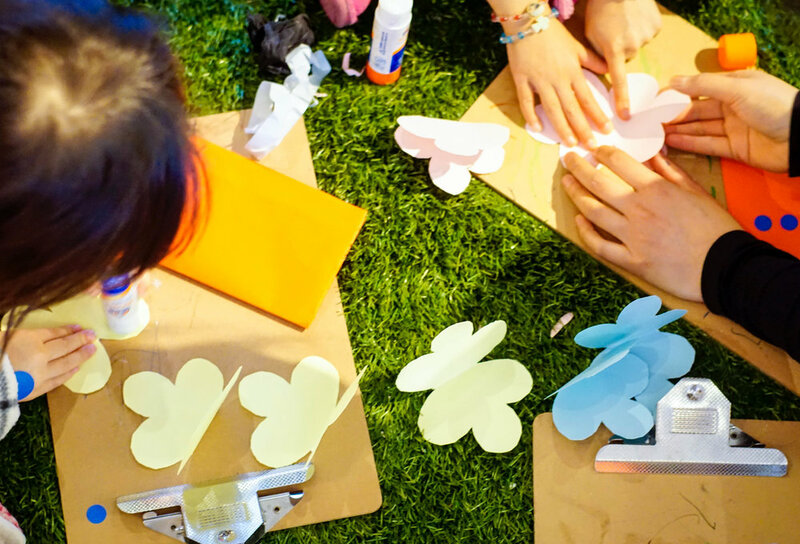 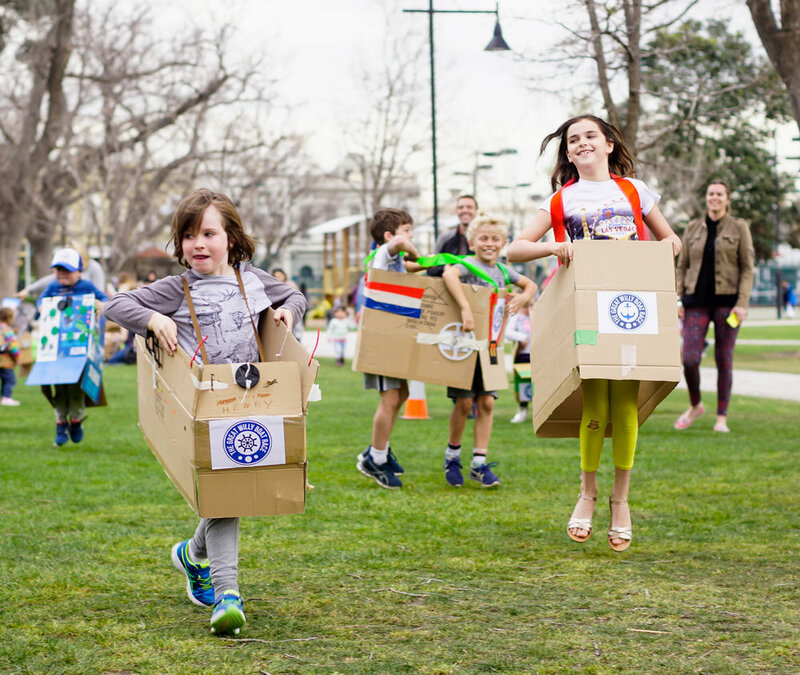 The Great Willy Boat Race was a free, facilitated, drop-in style construction play event suitable for children aged 2+ years as part of a school holiday activation at Commonwealth Reserve, Williamstown. 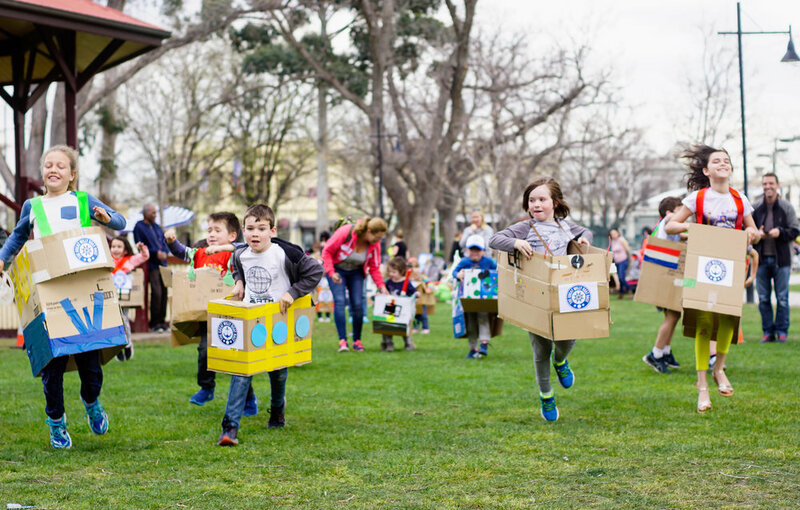 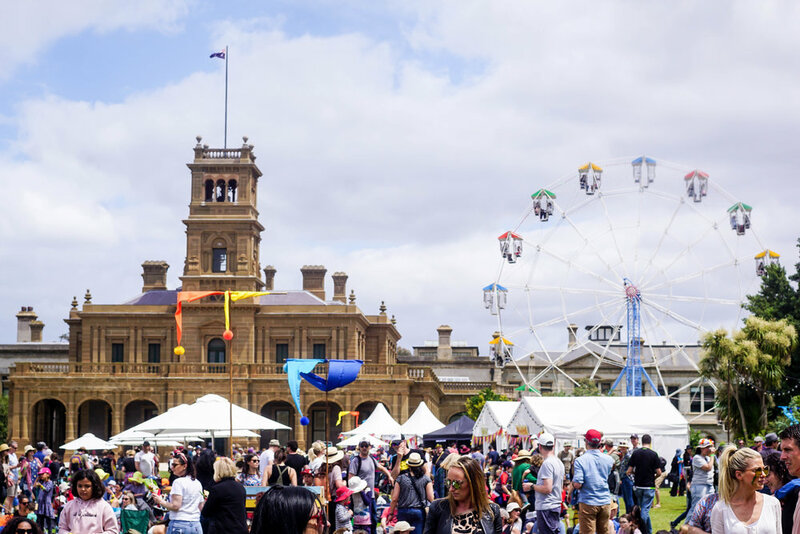 Inspired by the shipbuilding heritage of Melbourne's west and the Williamstown marina, The Great Willy Boat Race invited children (and adults!) 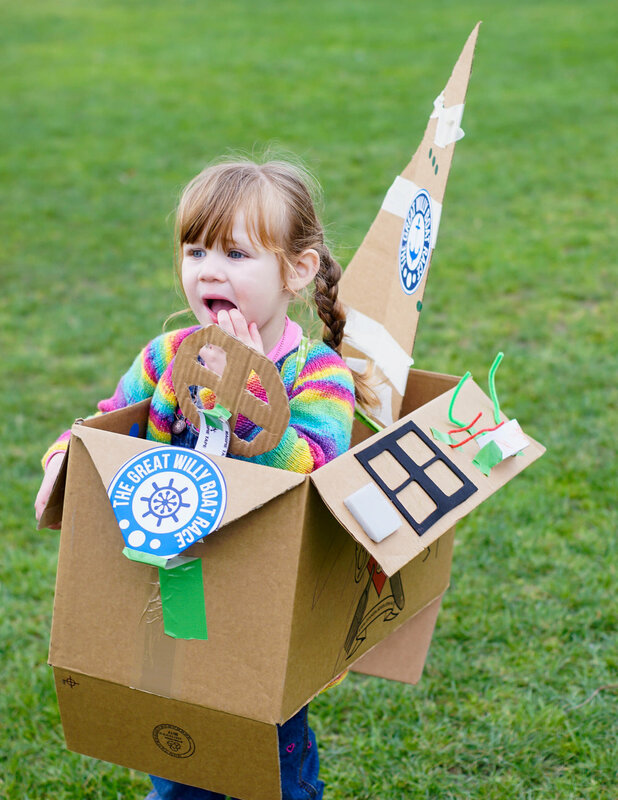 to build to make their own version of a bottomless boat using only cardboard boxes and recycled craft materials. 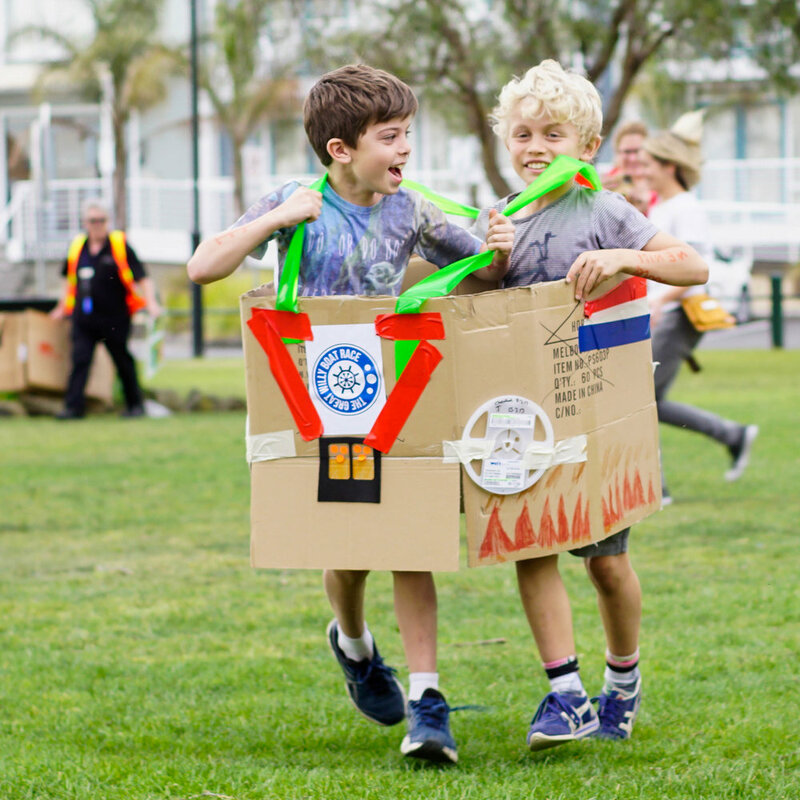 Children then 'launched' their boat in a foot race - The Great Willy Boat Race - and were able to take their boat home for more play. 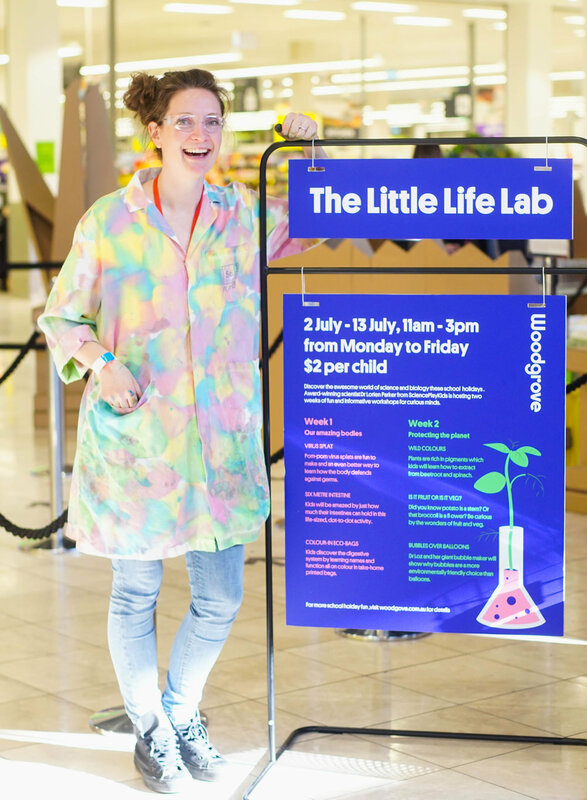 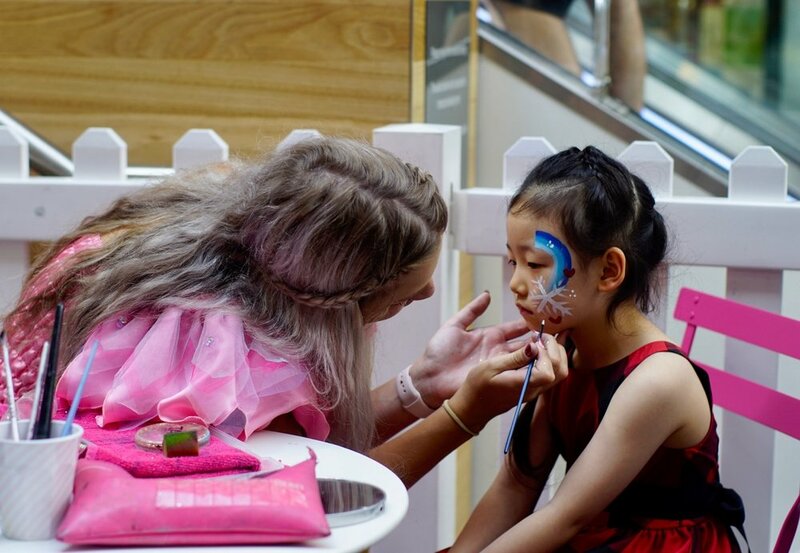 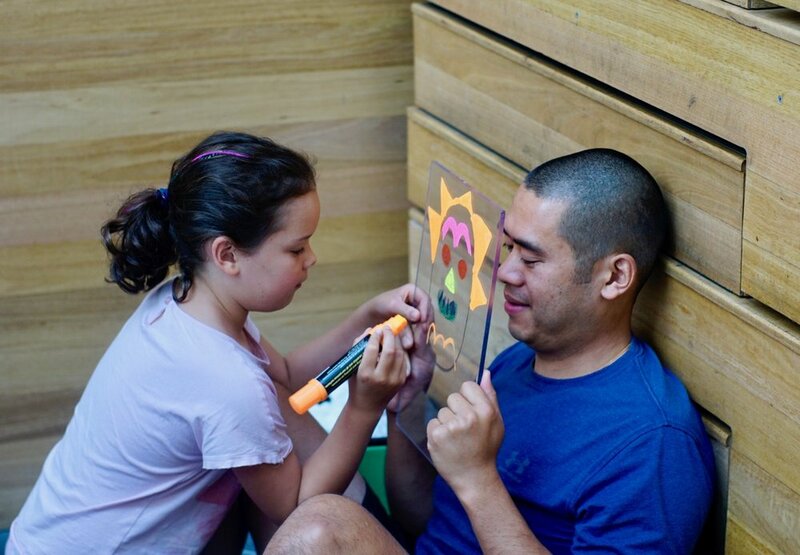 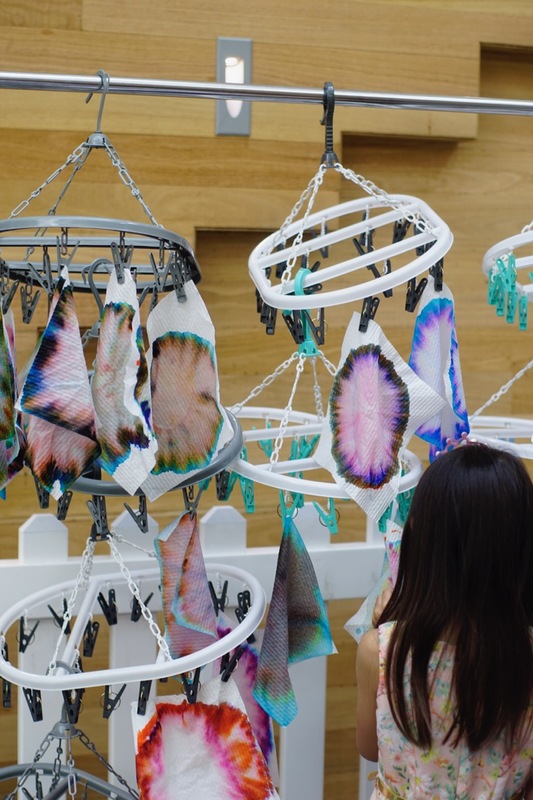 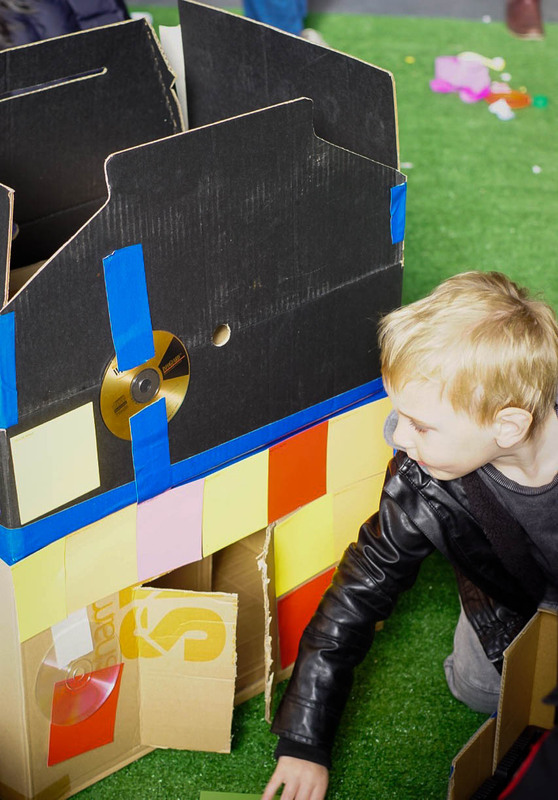 The Inspire9 Dream City was a semi-facilitated, drop-in construction play and city-making activation for families. 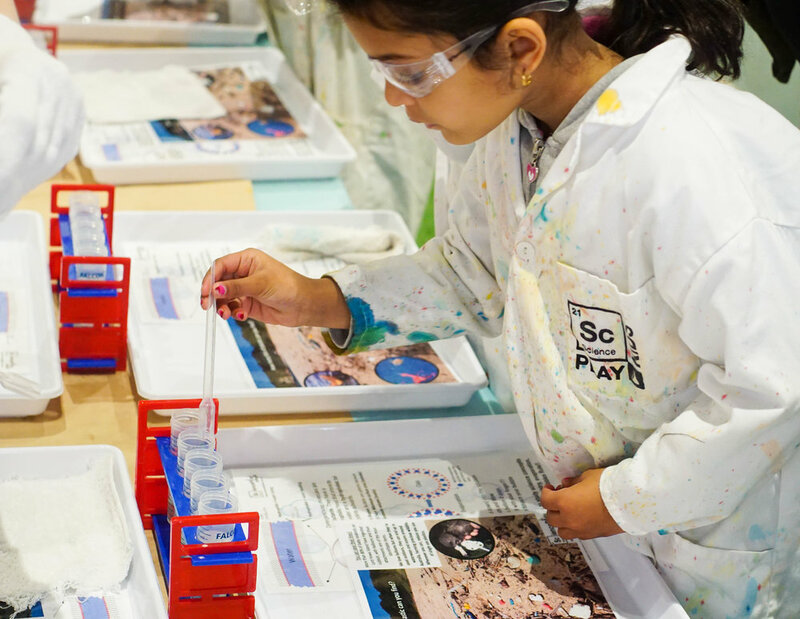 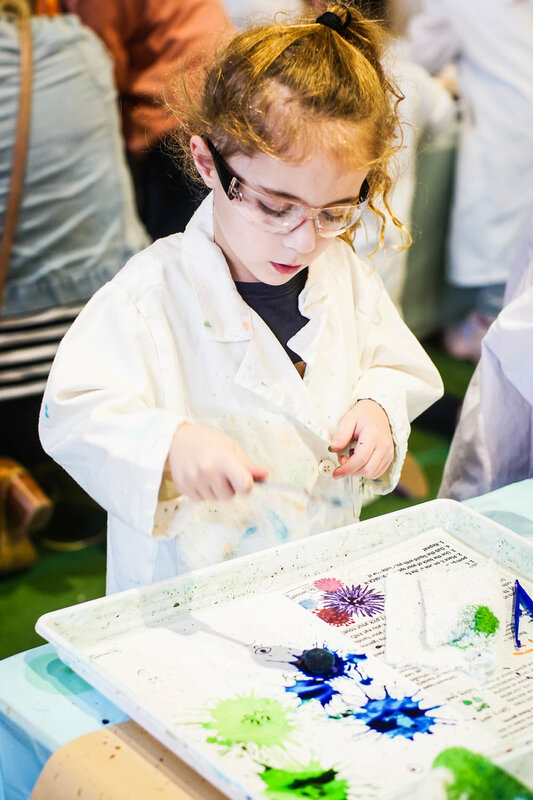 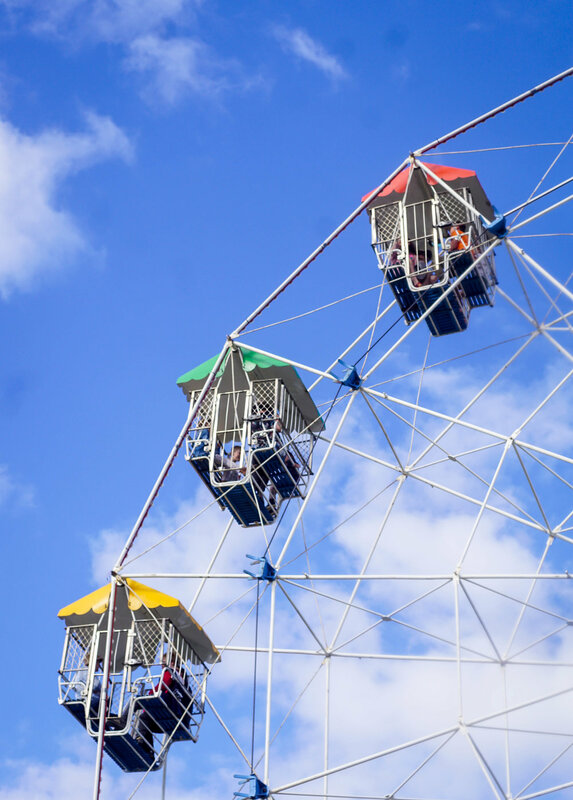 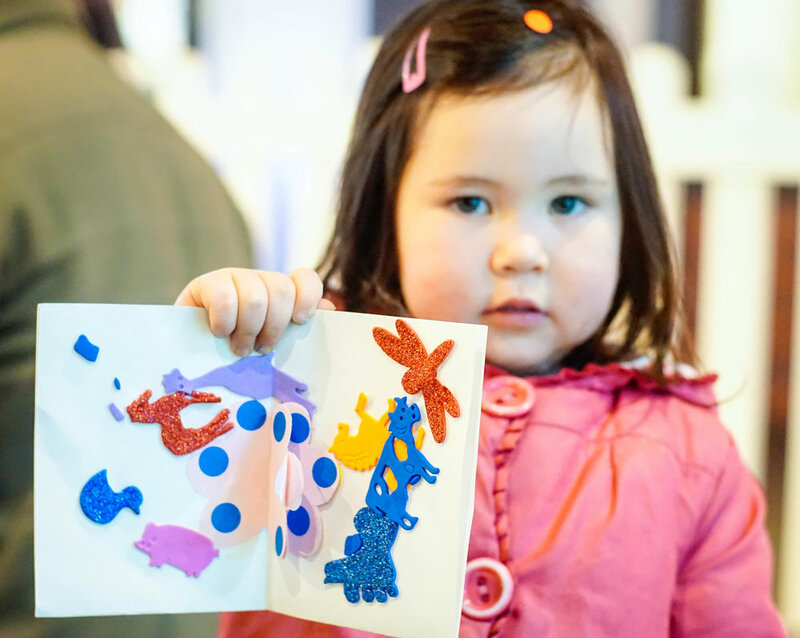 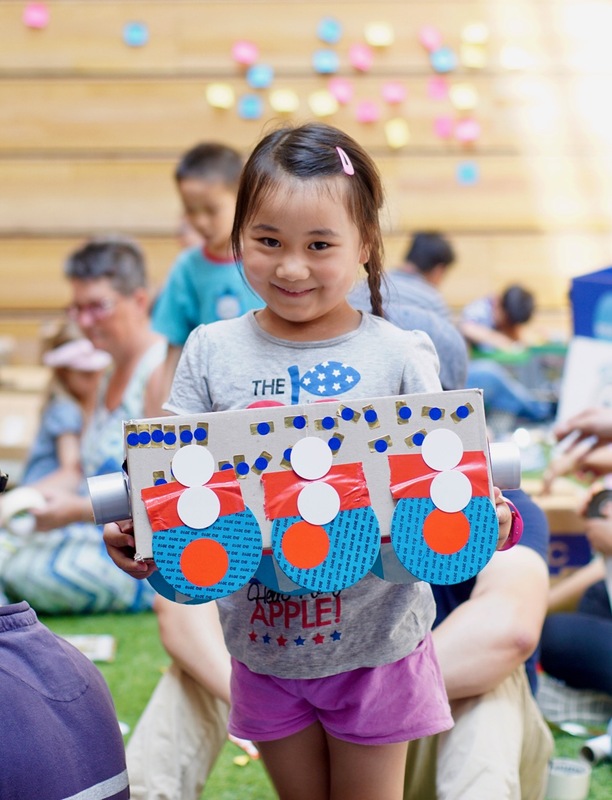 Families were invited to consider the places and spaces that make up their 'dream city', as inspired by the Maribyrnong River and the landscape and cityscape surrounding the Dream Factory. 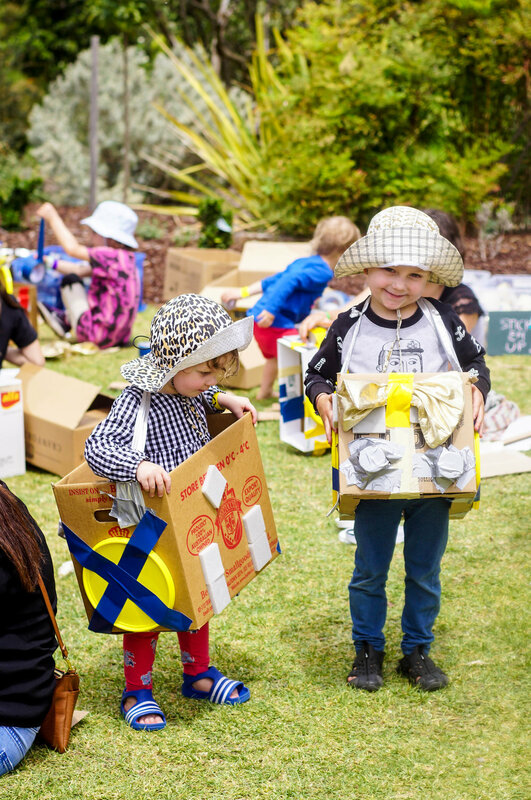 We assisted families in creating buildings, bridges, boats and fantastical structures using cardboard and recycled craft materials. 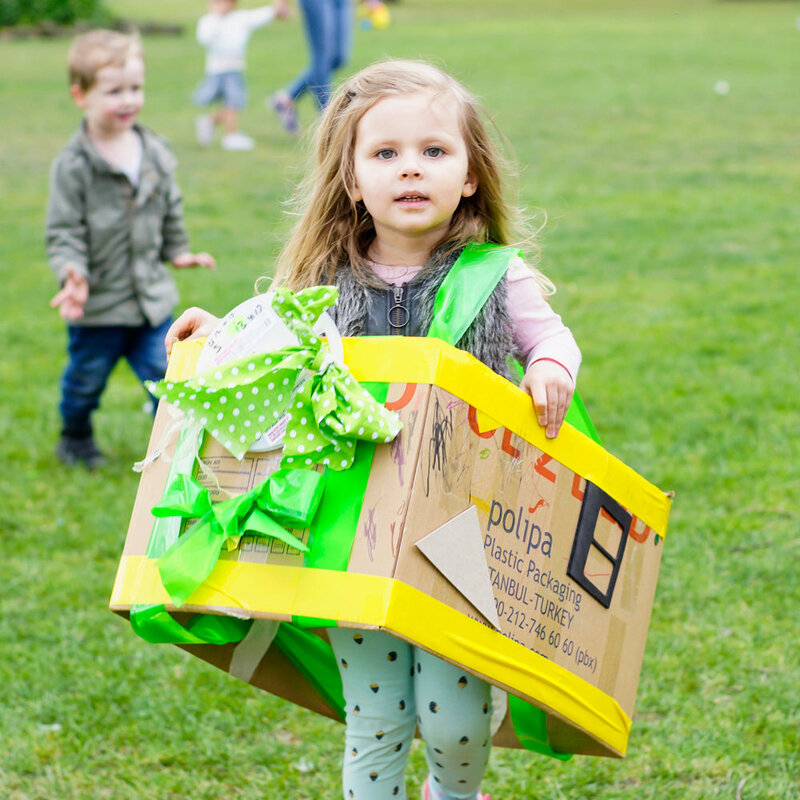 During the school holidays families continued to drop-in to contribute their landscapes and structures to the growing Dream City. 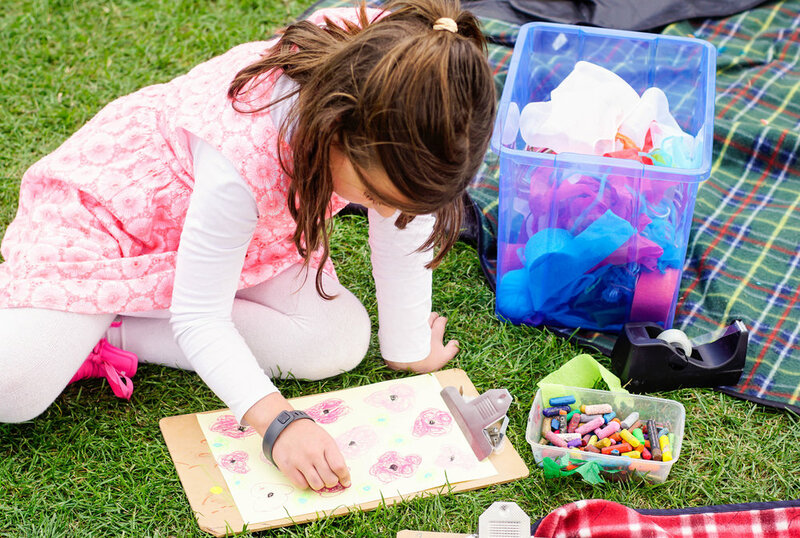 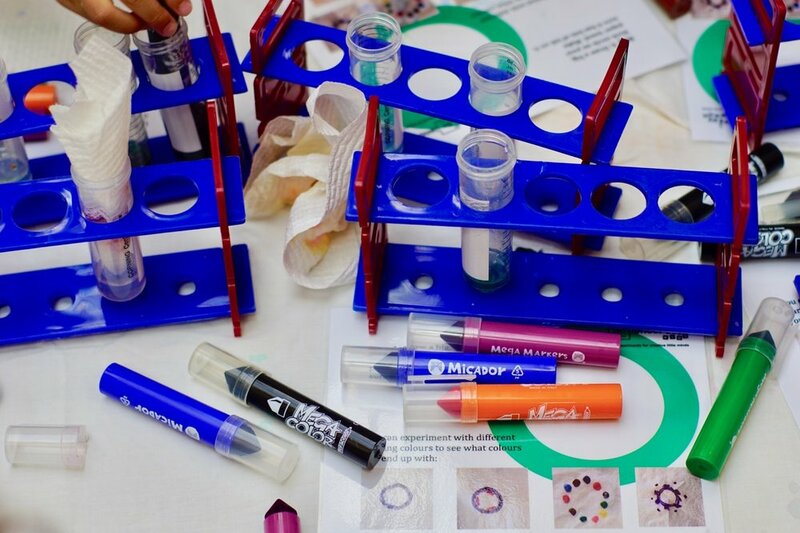 We provided craft materials, instructions and creative prompts so that the activity could be completed without constant facilitation. 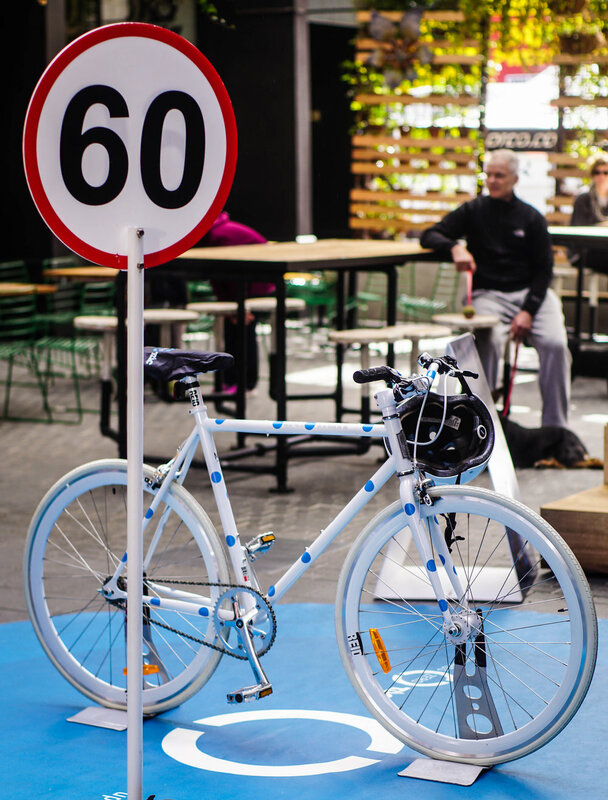 The Inspire9 Dream Factory was developed for 9Fest, a month-long ideas festival to celebrate the opening of Inspire9 Footscray co-working space at the Dream Factory. 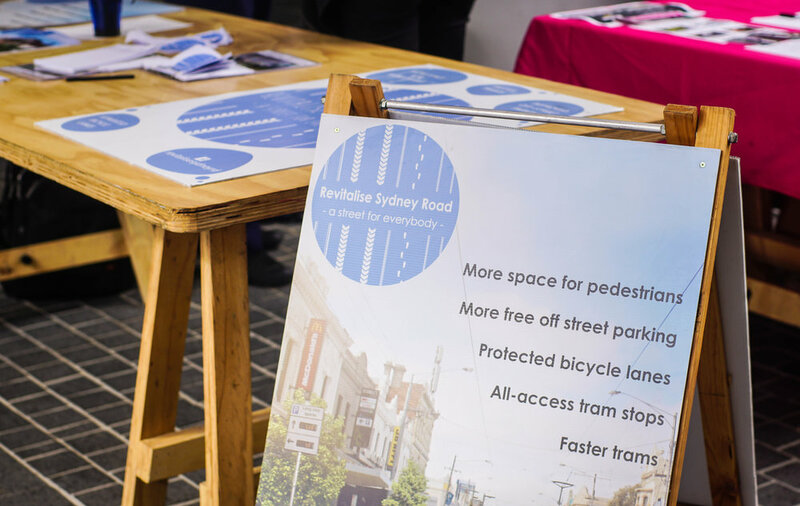 Produced for Creative Suburbs and Inspire9. 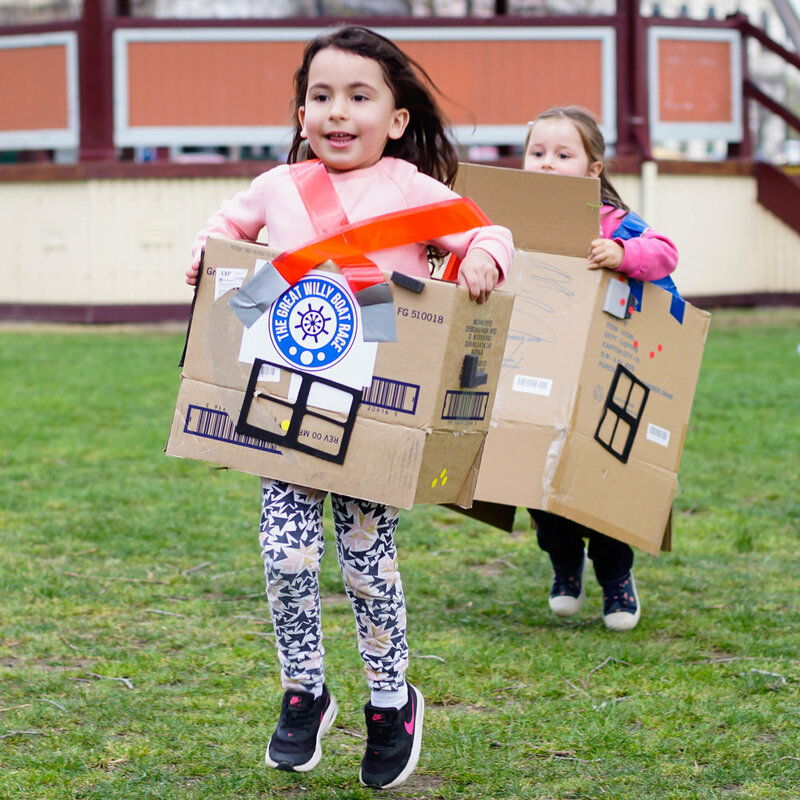 Free [Play] Tram Zone was a semi-facilitated, drop-in construction play activation for families in Docklands as part of the first 'Sunday Streets' program. 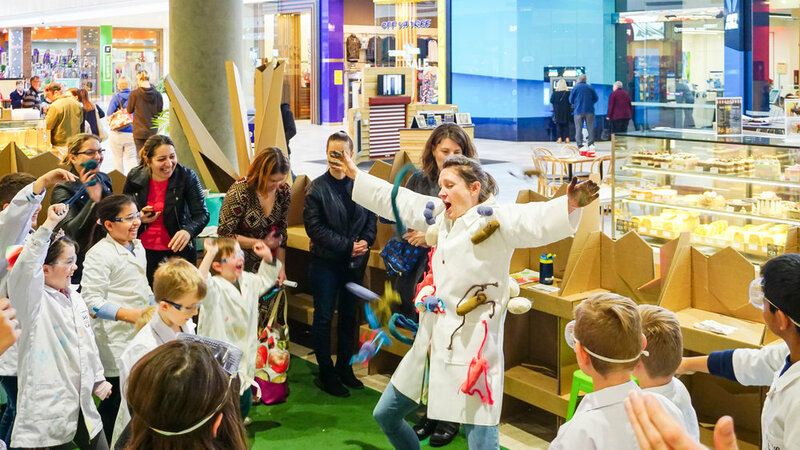 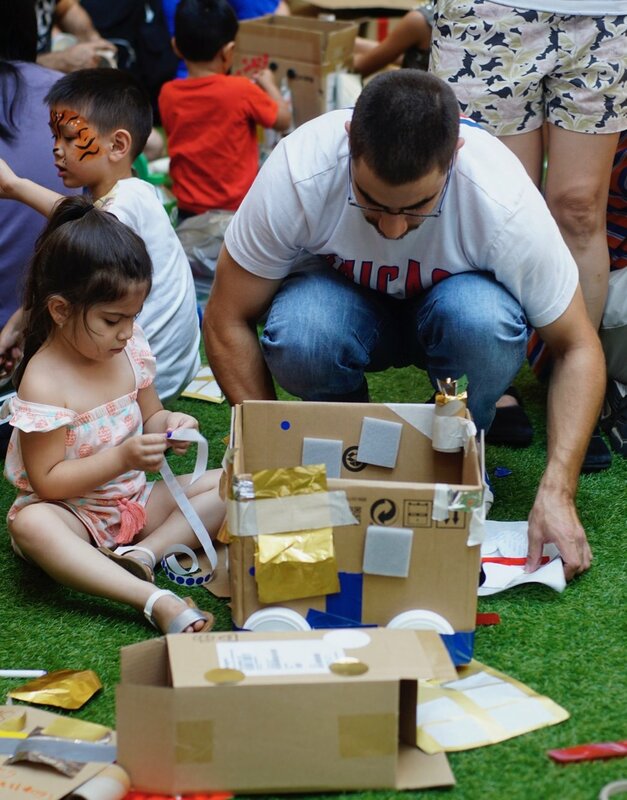 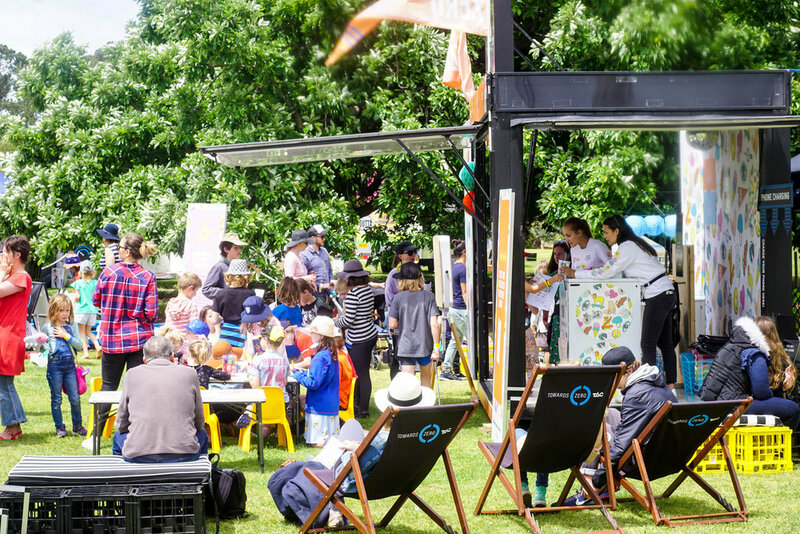 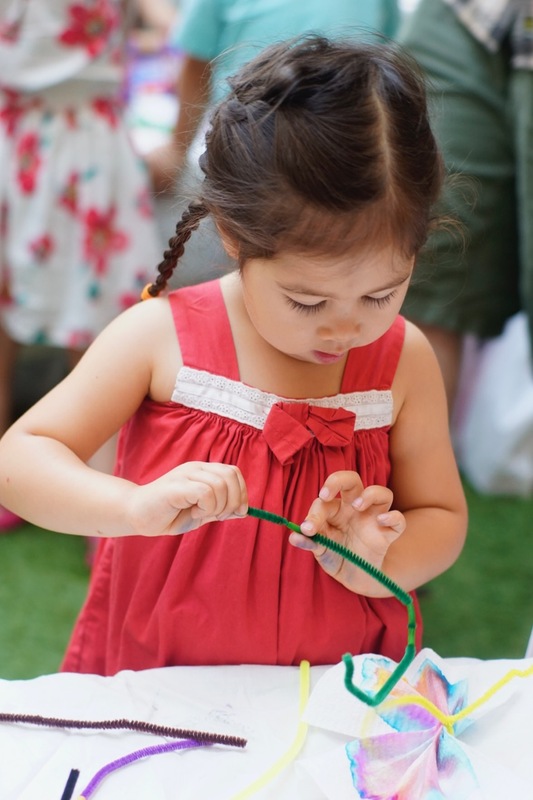 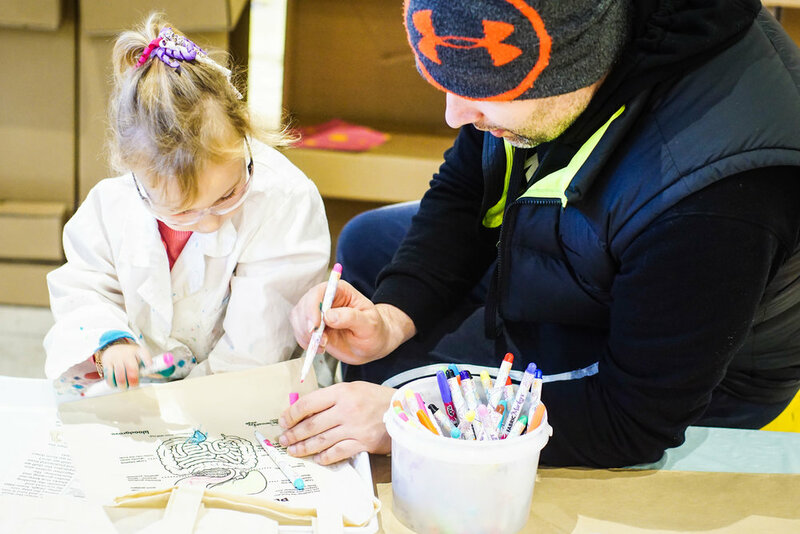 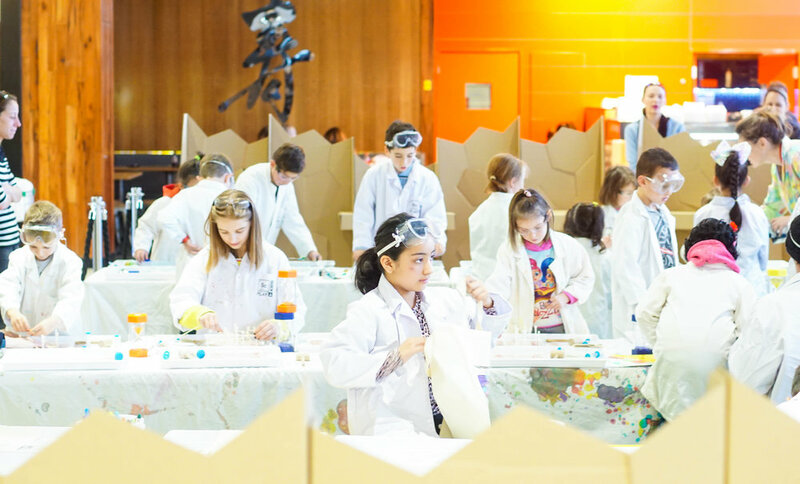 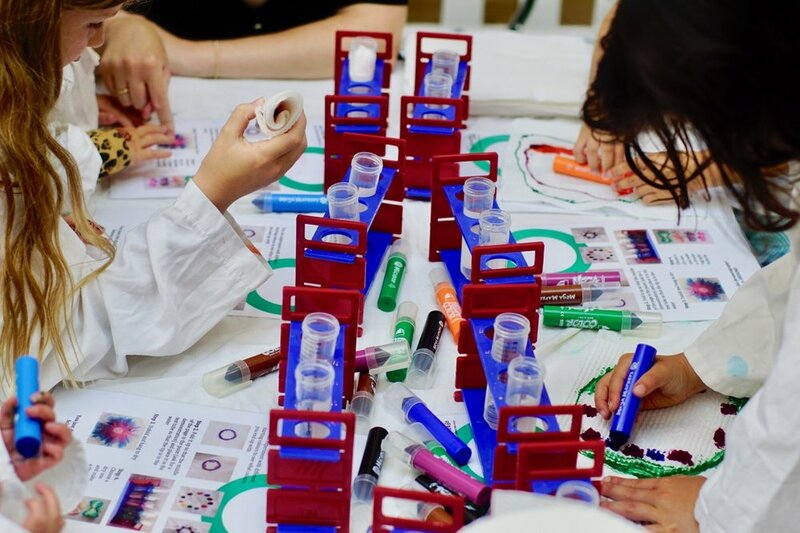 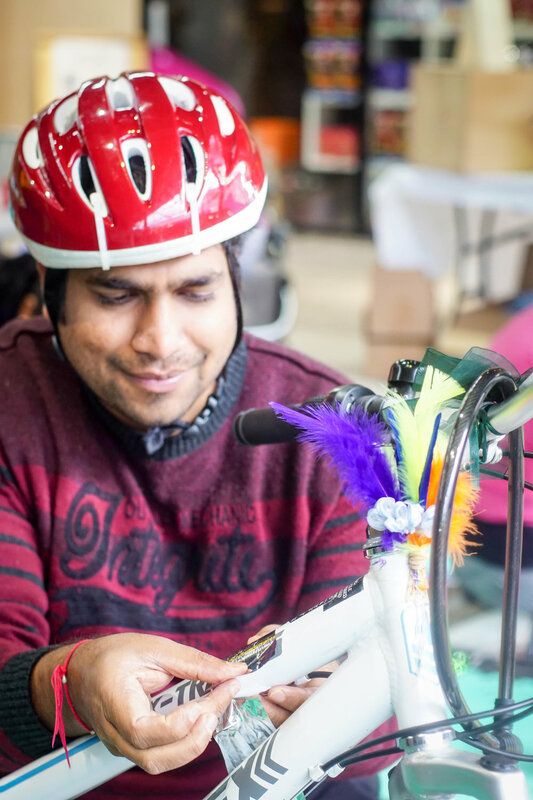 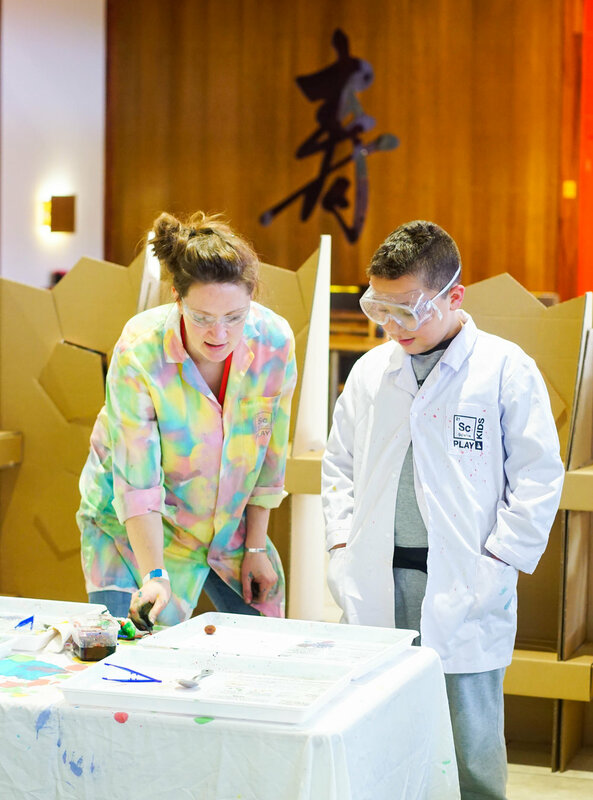 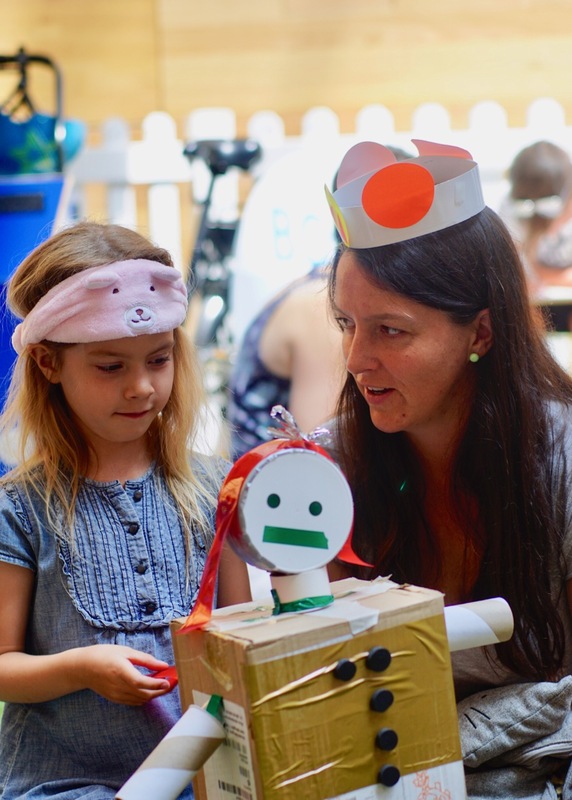 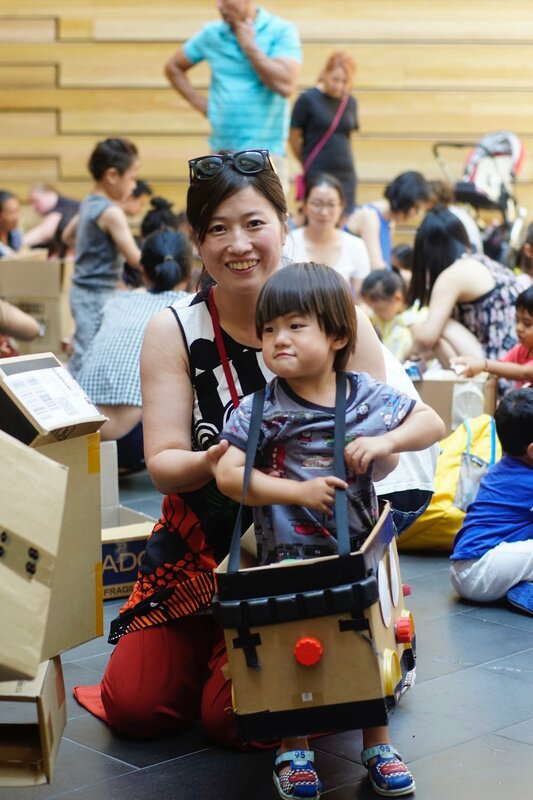 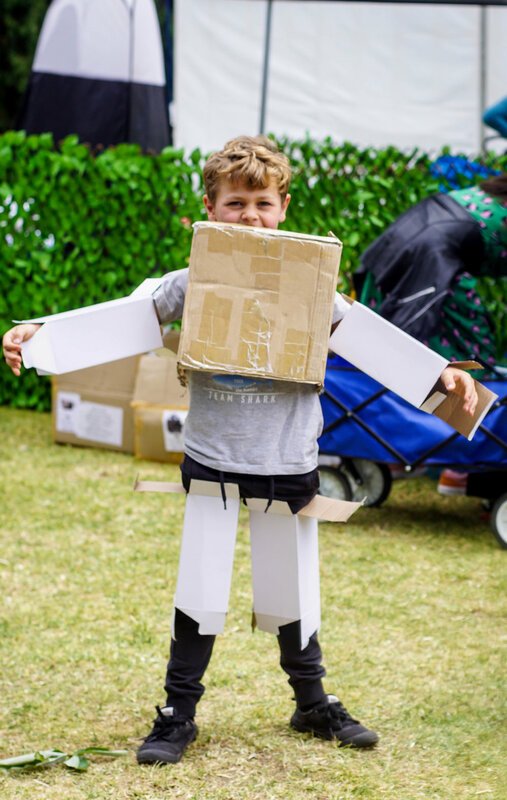 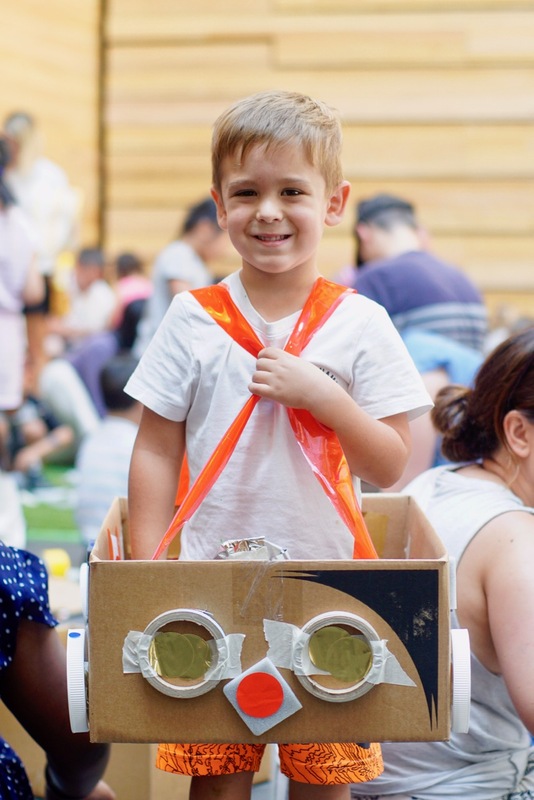 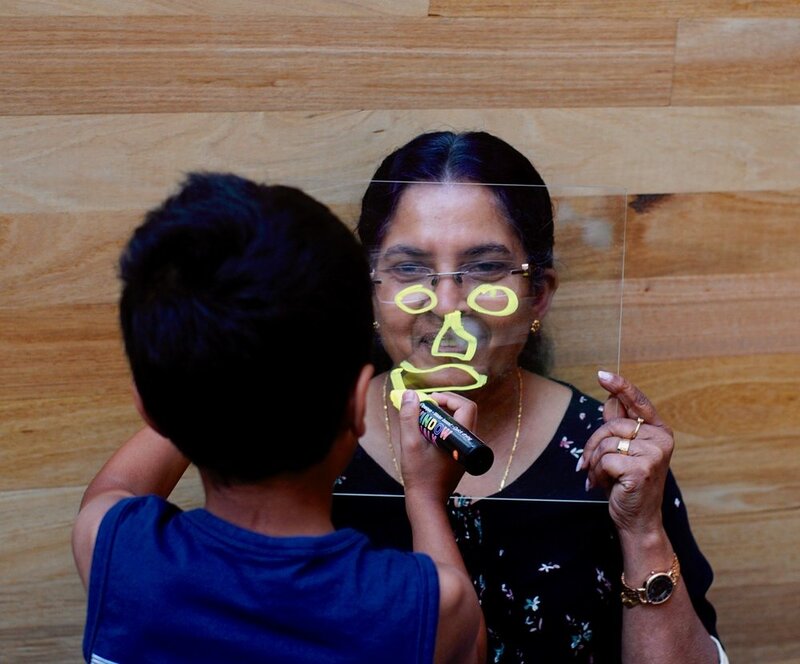 Families were invited to re-imagine Melbourne's tram network by building their own trams, signals and signage using cardboard and recycled craft materials. 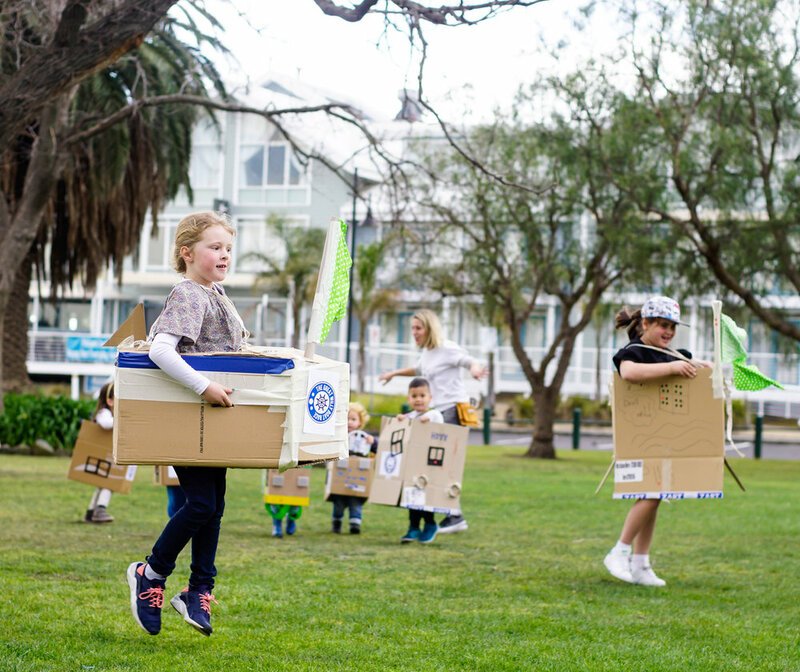 Children could then race their vehicles against others in a footrace along Harbour Esplanade. 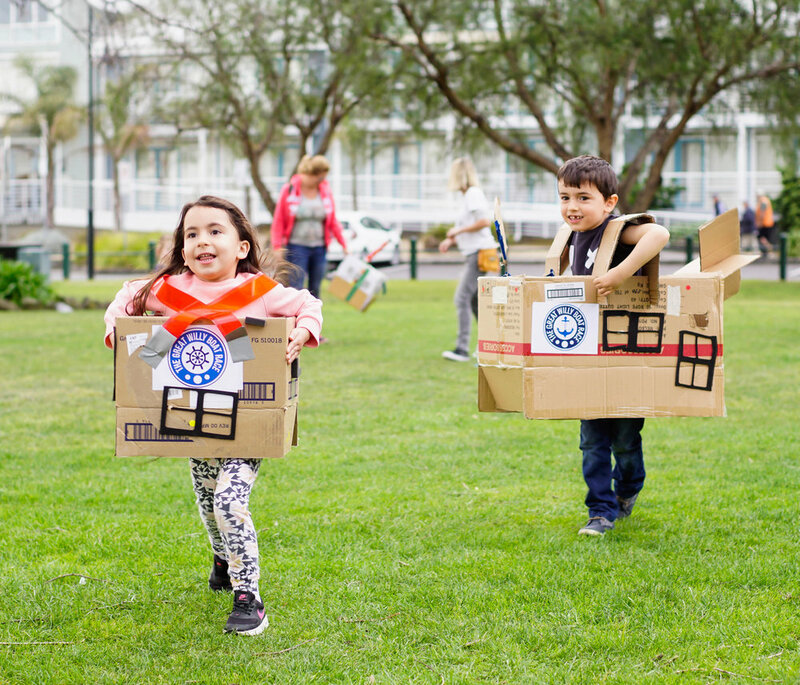 Free [Play] Tram Zone was one of the various free activities provided for Docklands families to activate Harbour Esplanade and to encourage social and community interactions between residents. 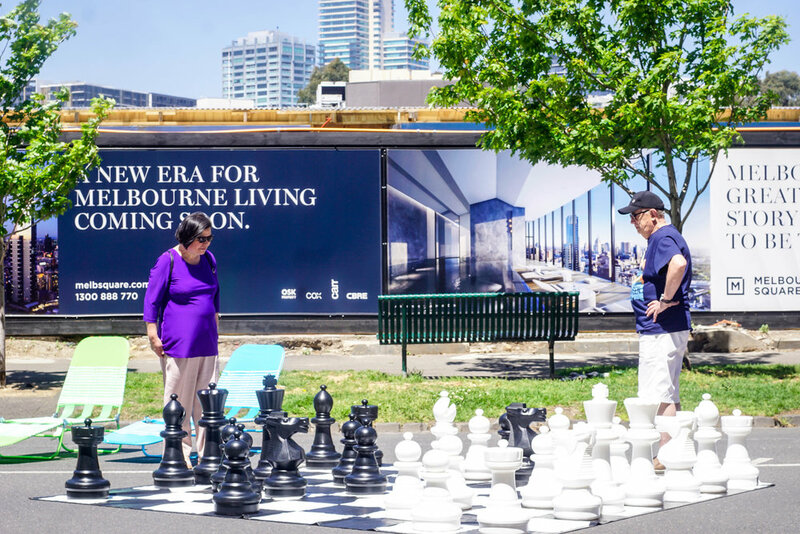 Produced for CoDesign Studio and City of Melbourne. 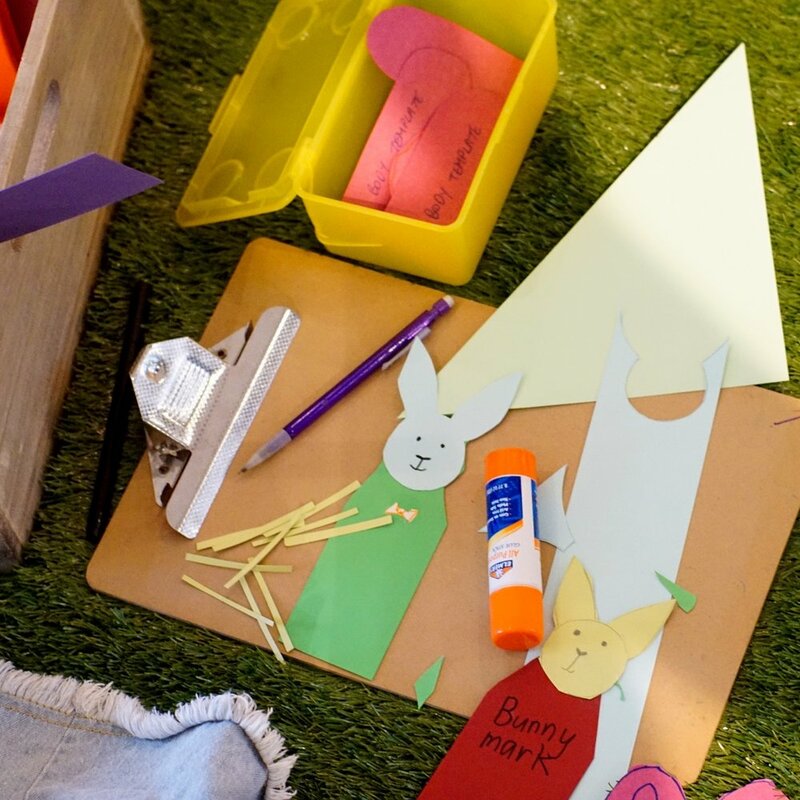 We were engaged to transform the Boyd Community Hub playgroup room into a gentle garden playscape for babies and toddlers to explore without facilitators. 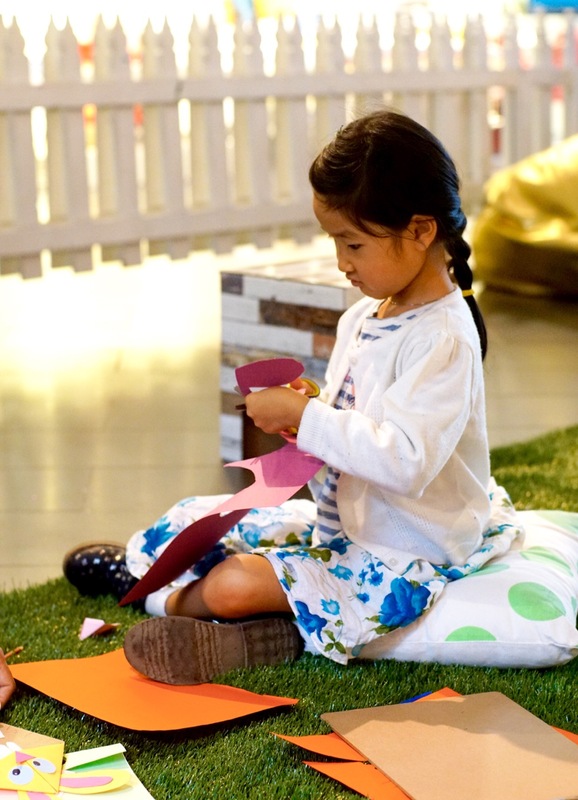 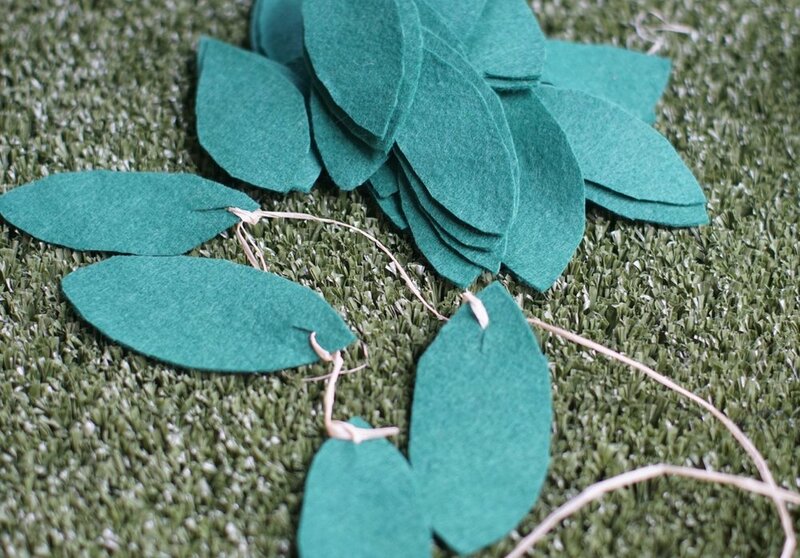 Each day families were invited to create and ‘reveal’ their secret garden, bit by bit, using huge felt walls and felt pieces. 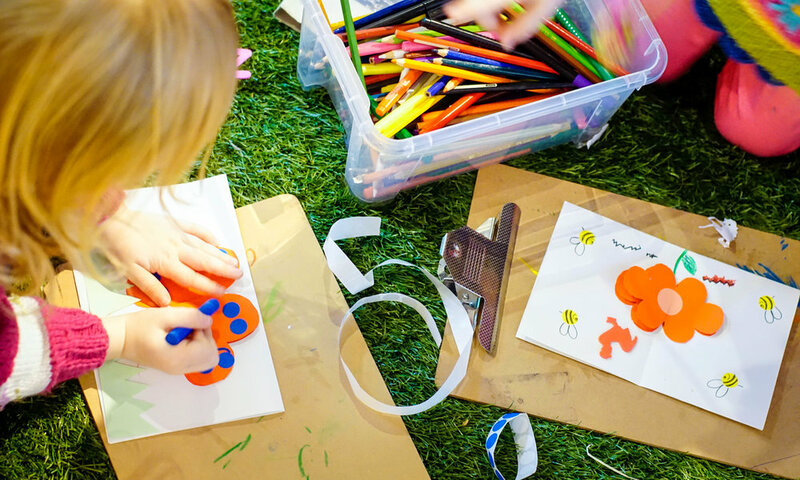 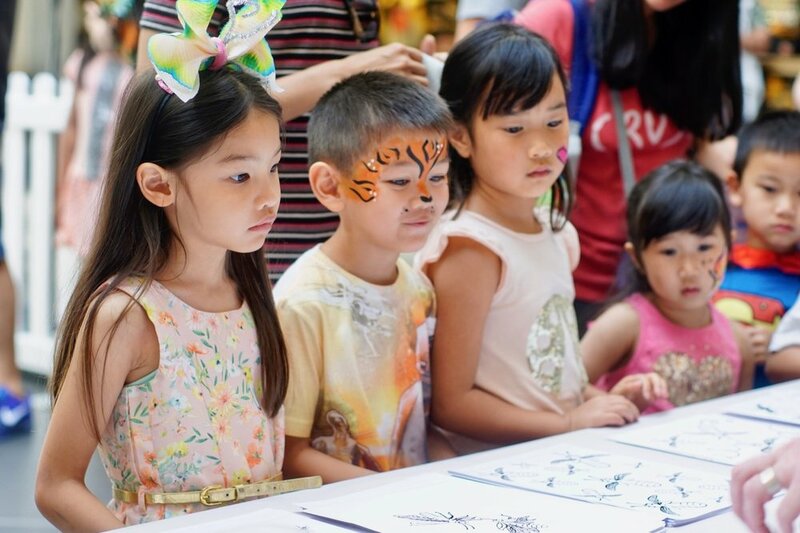 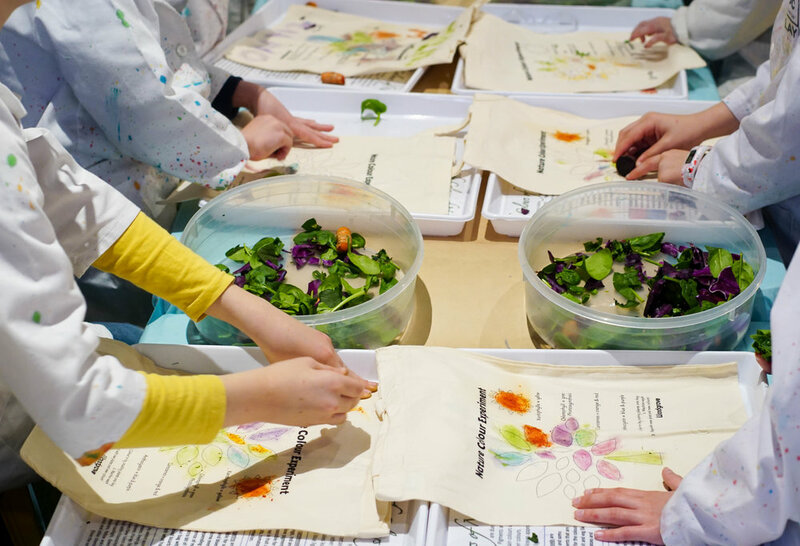 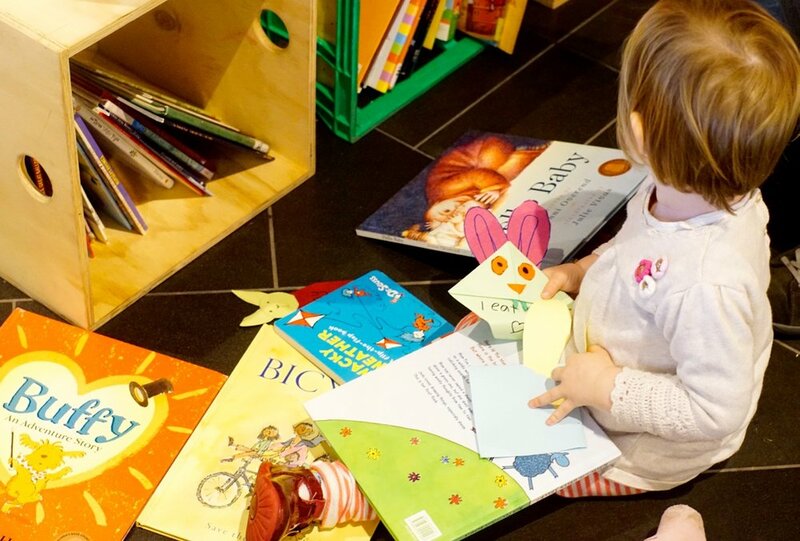 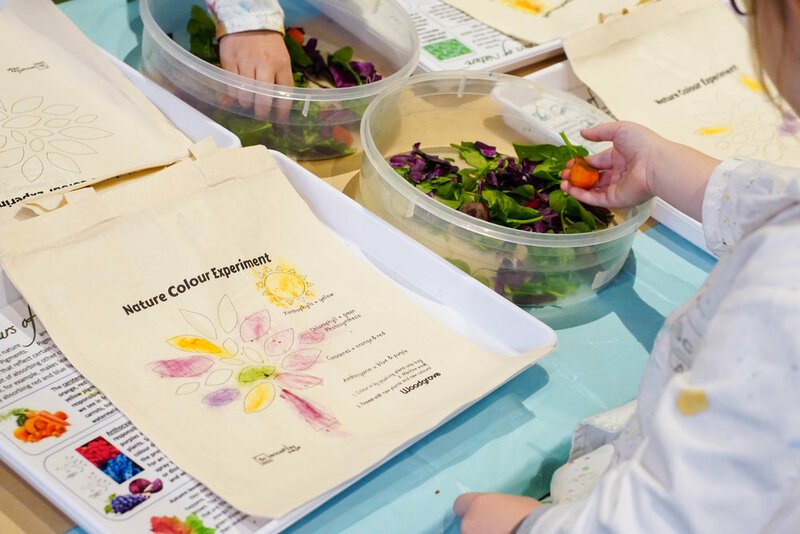 Children could also go on a treasure hunt, read a book about plants, forests or gardening, scribble on the chalkboard or just lie back and listen to the relaxing soundscape. 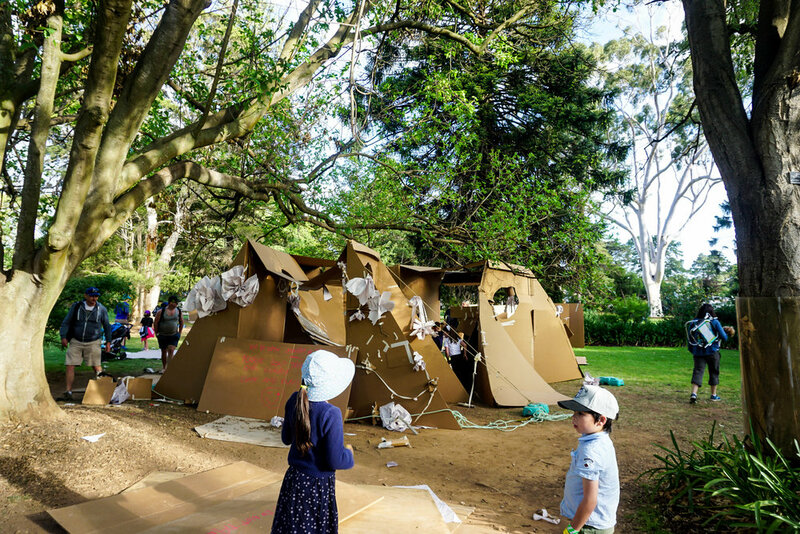 The Secret Garden at Boyd was created for City of Melbourne in collaboration with sound artist Architecture of Audio. 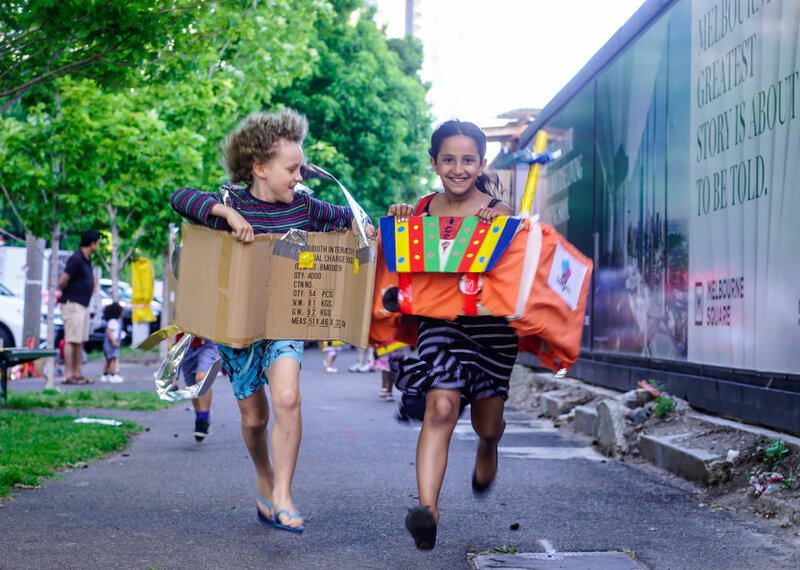 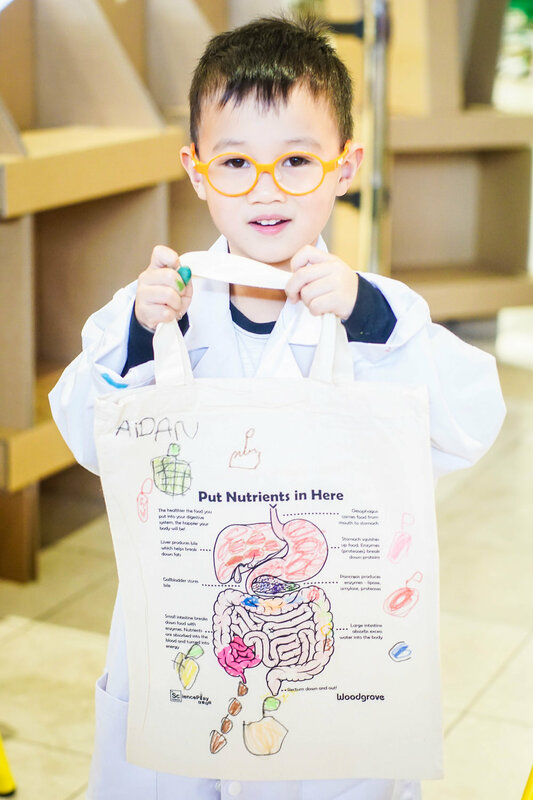 Play Streets is an international program encouraging kids to play on the streets in a safe environment and to inspire local community conversations and social interaction. 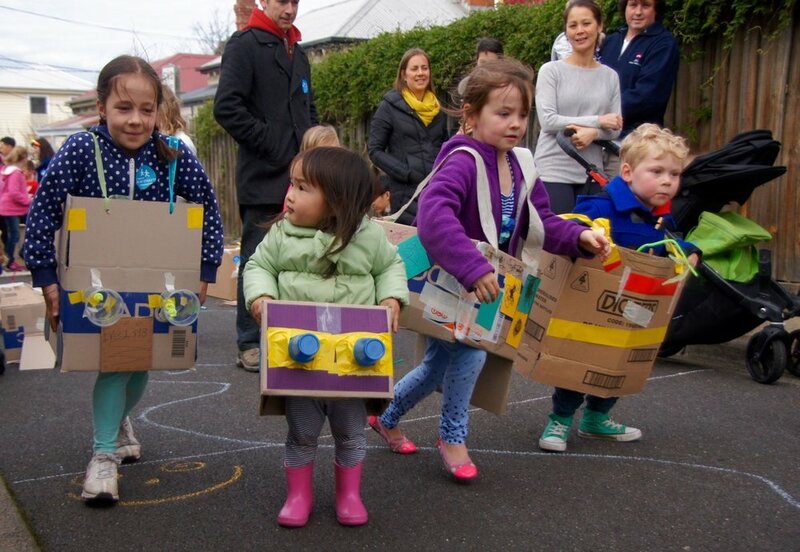 To launch the first Play Streets in Australia we created a free construction play event overturning what streets are usually by - vehicles! 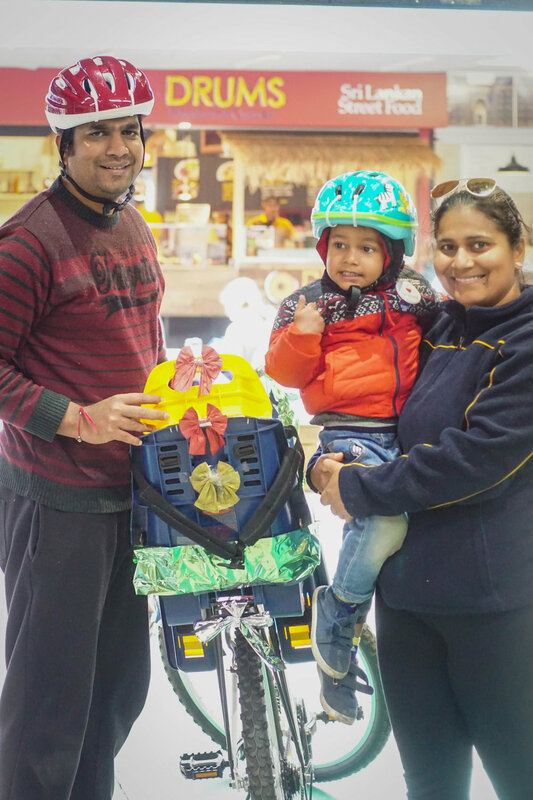 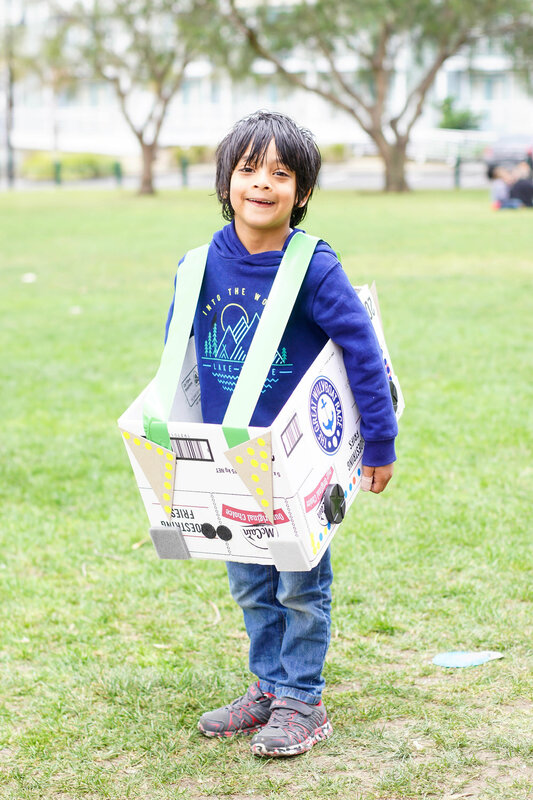 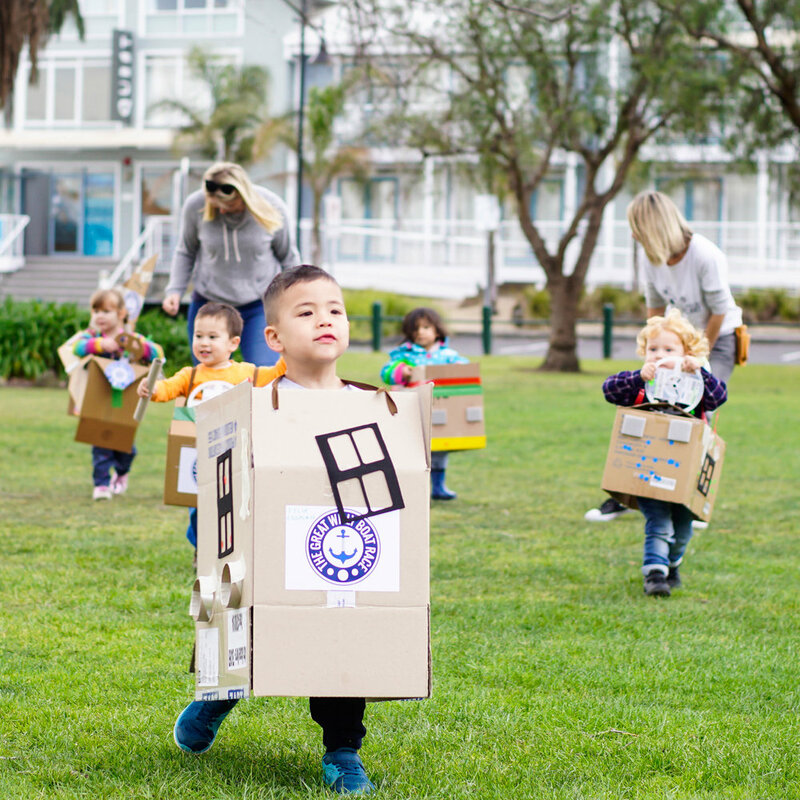 Families were invited to transform a cardboard box into a whizzbang racing car and then to take it out on the street race track to race their neighbours. 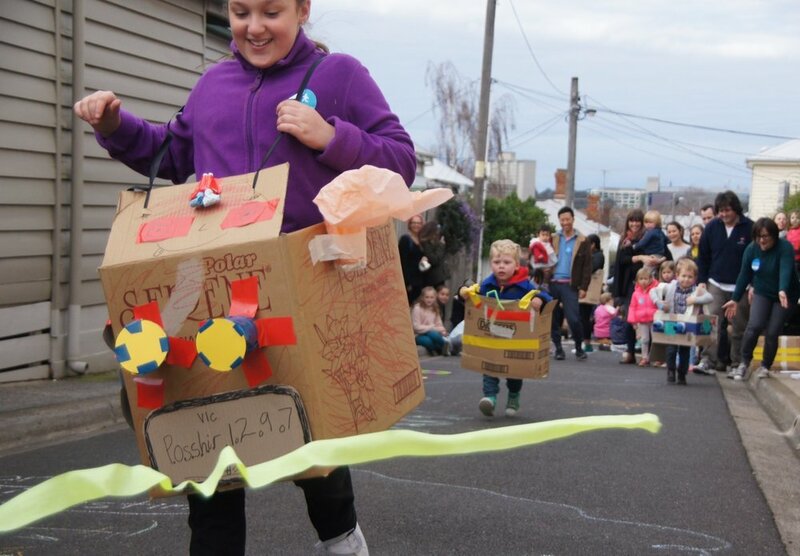 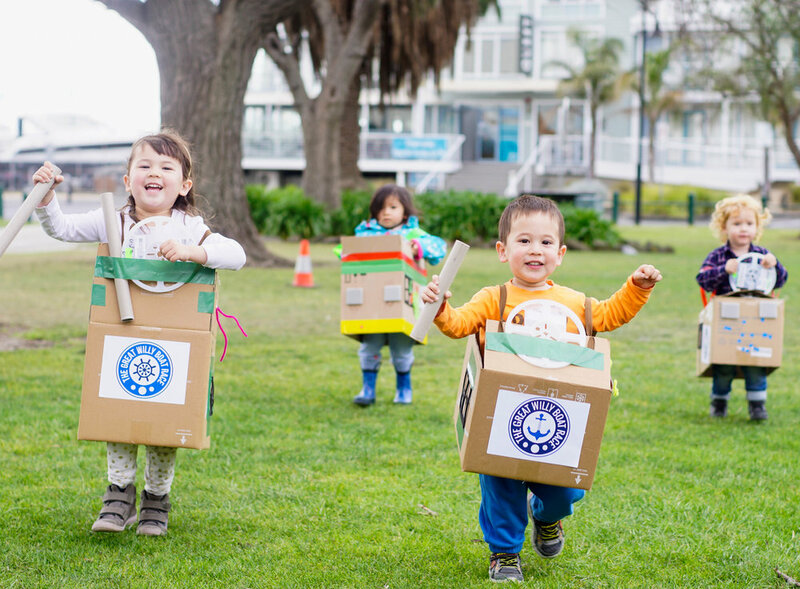 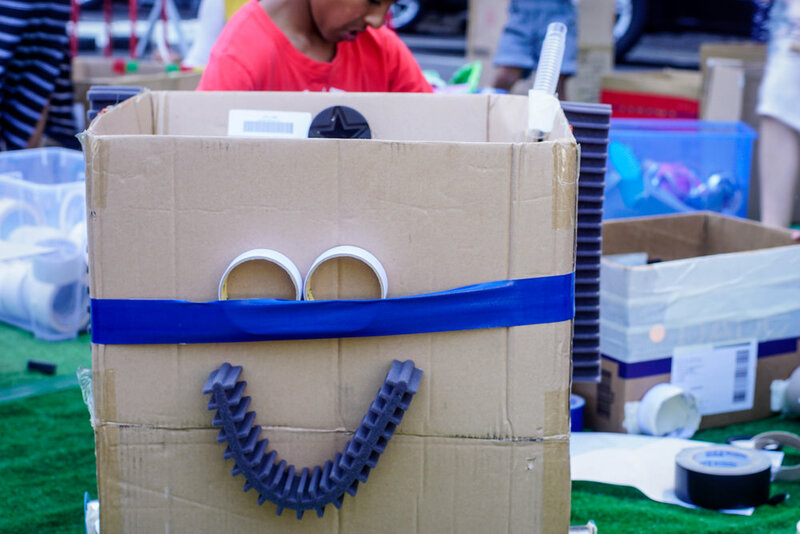 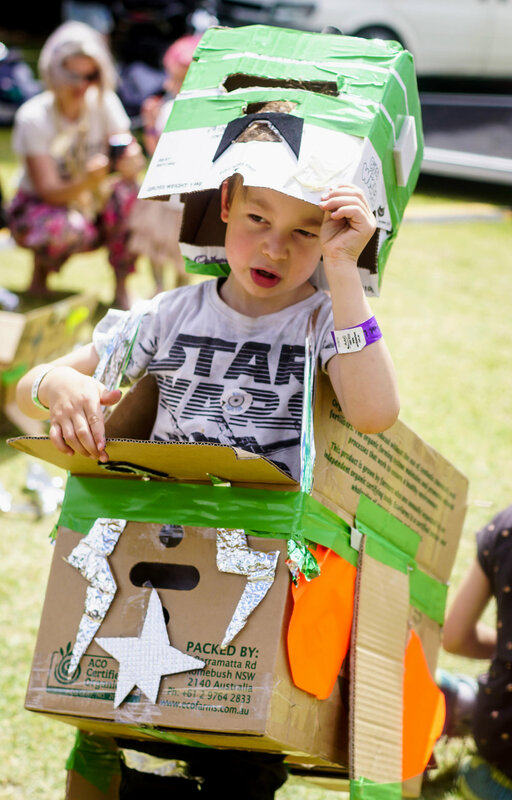 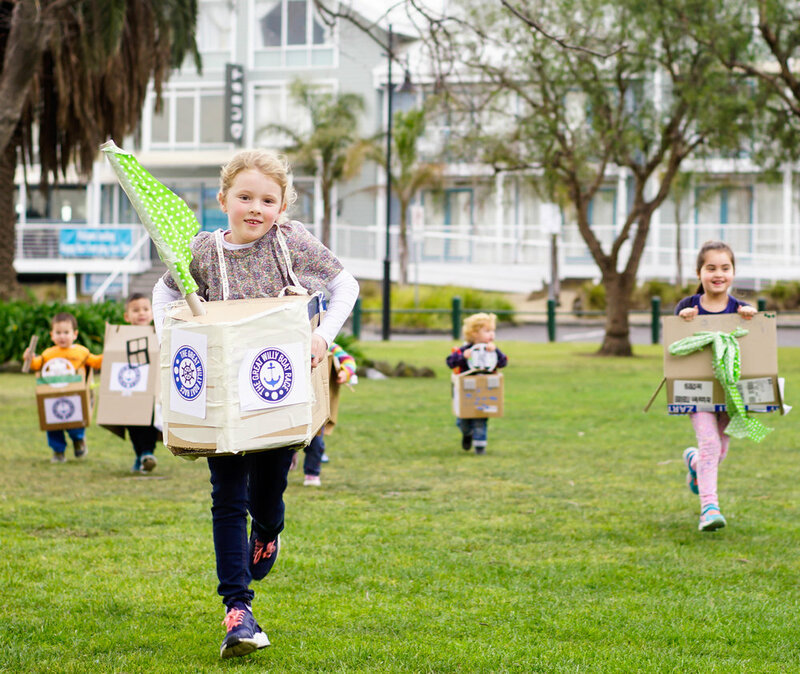 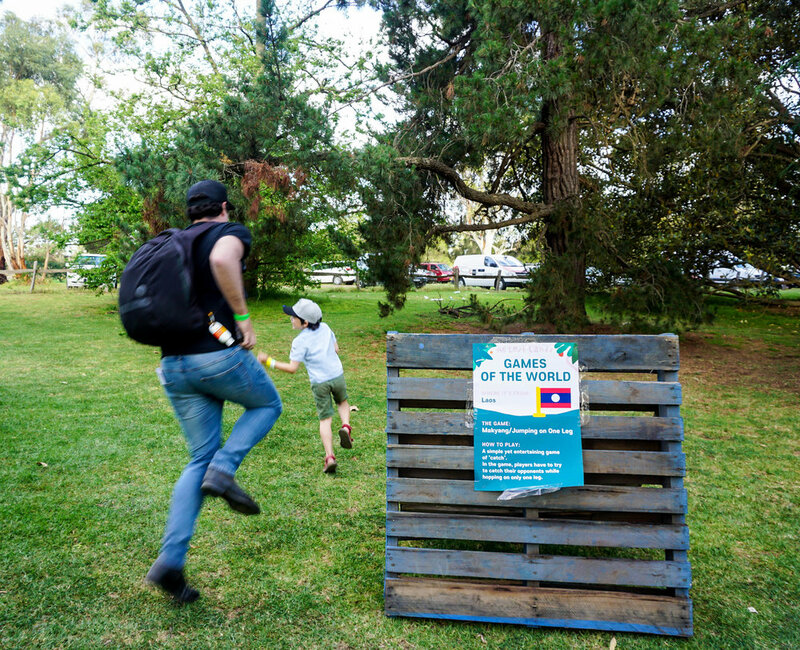 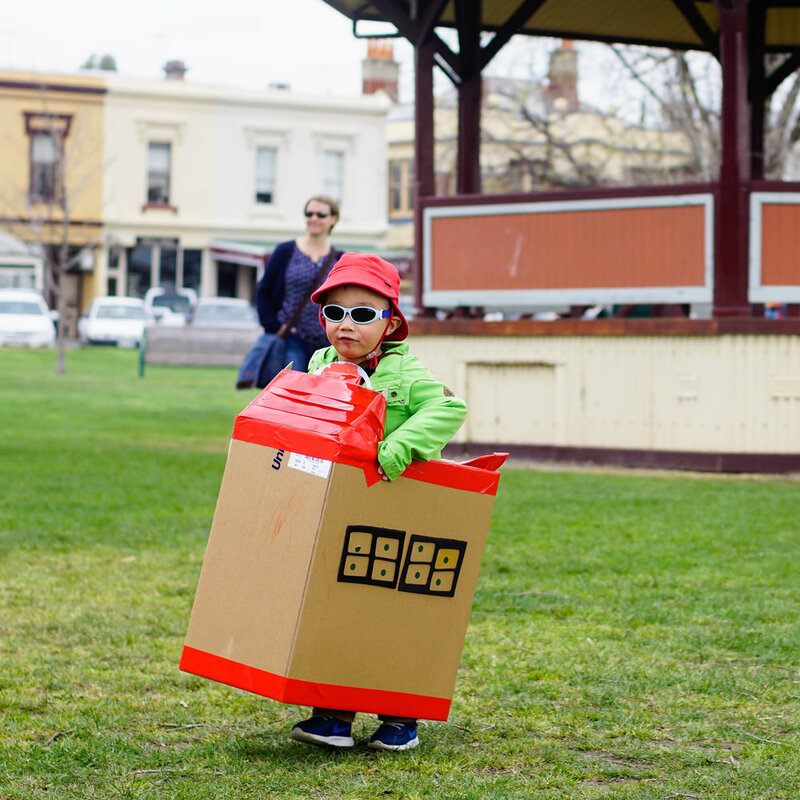 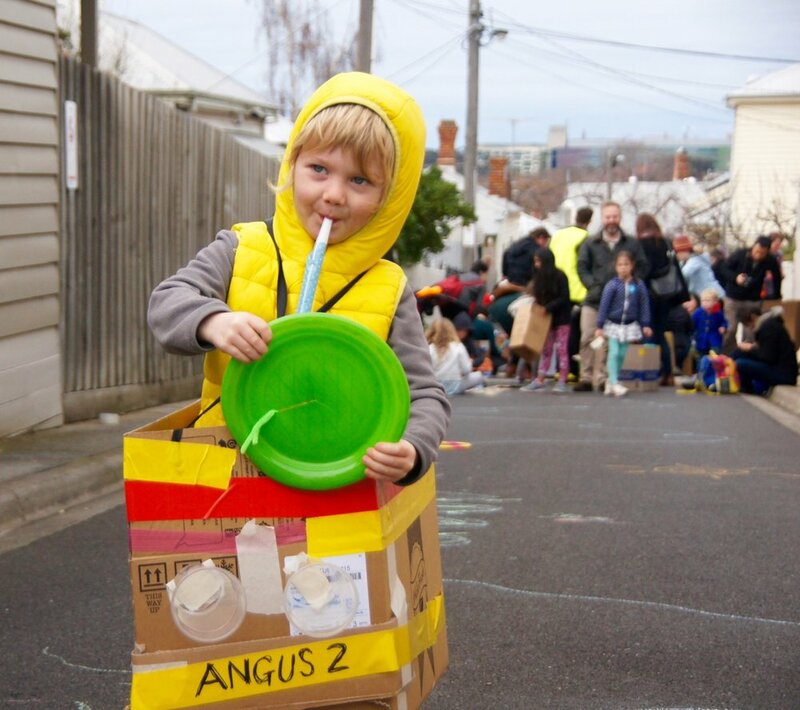 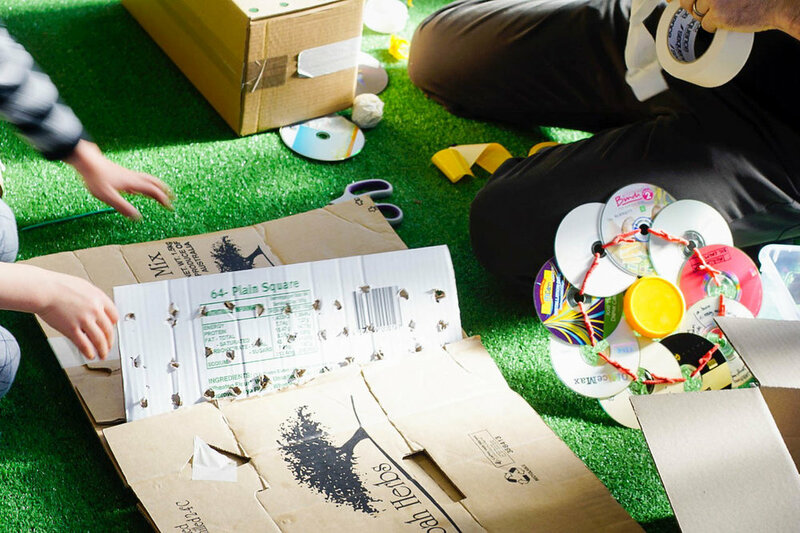 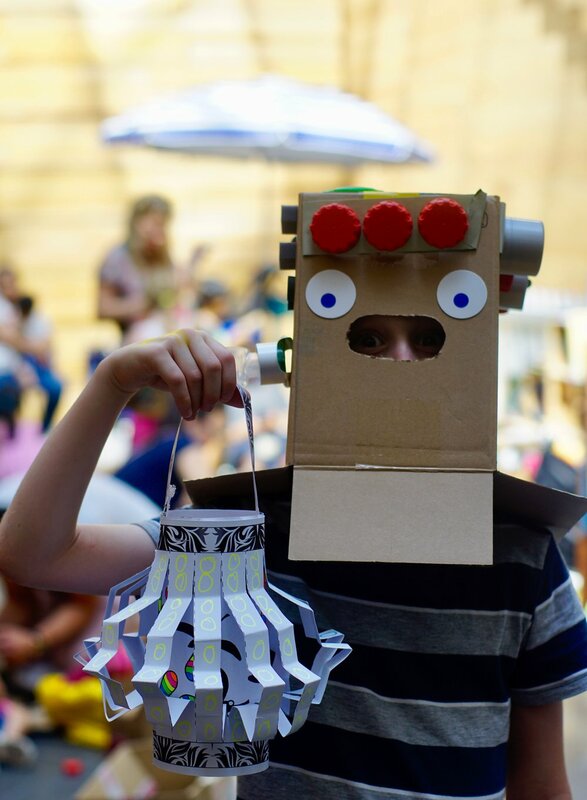 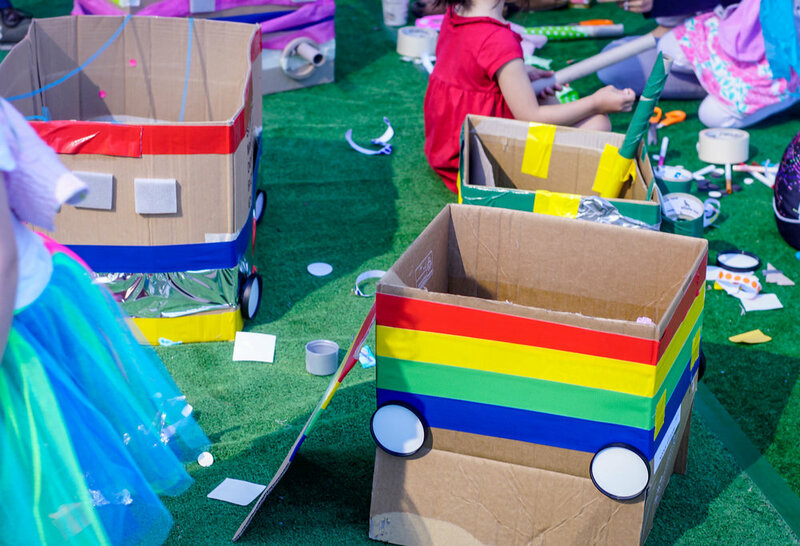 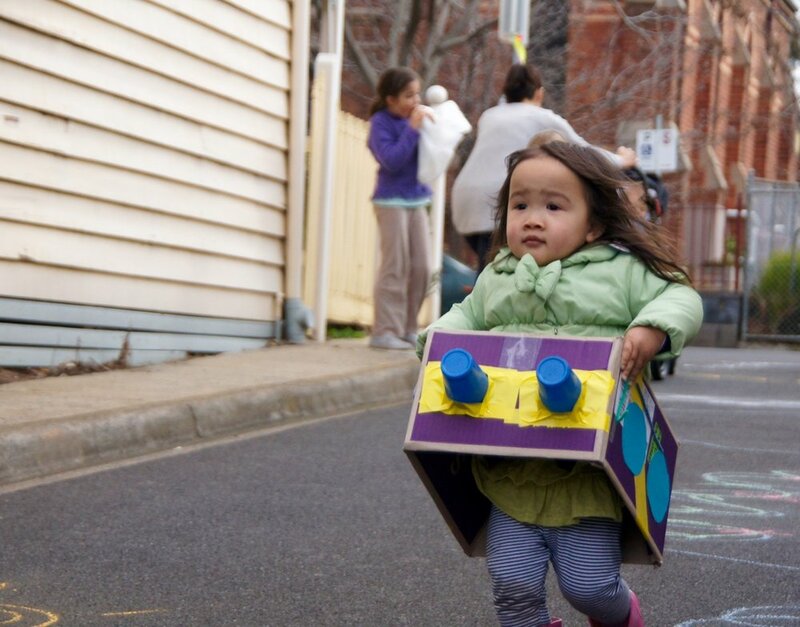 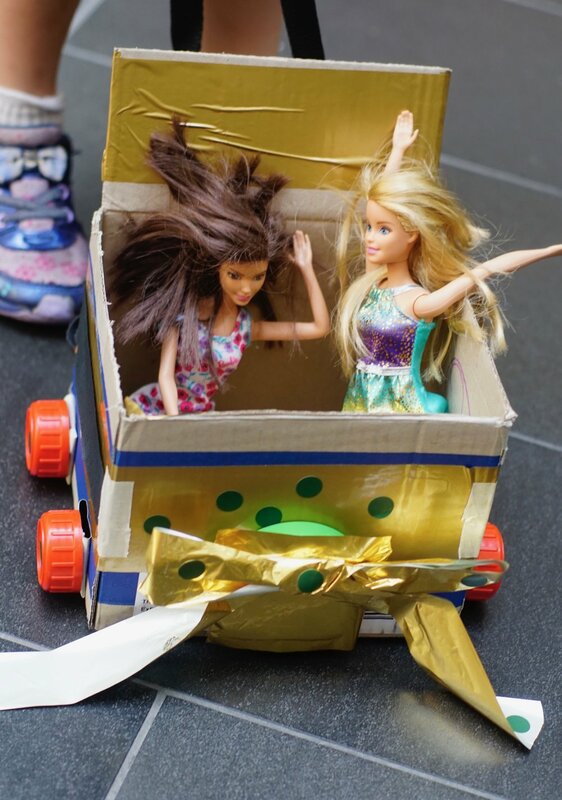 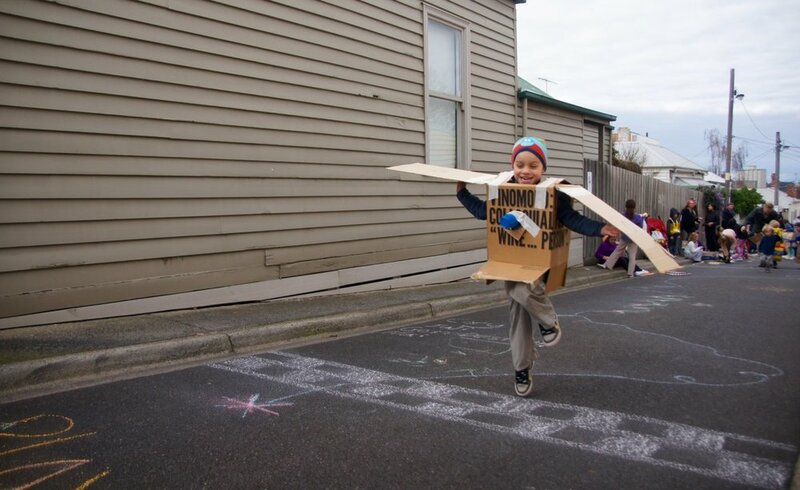 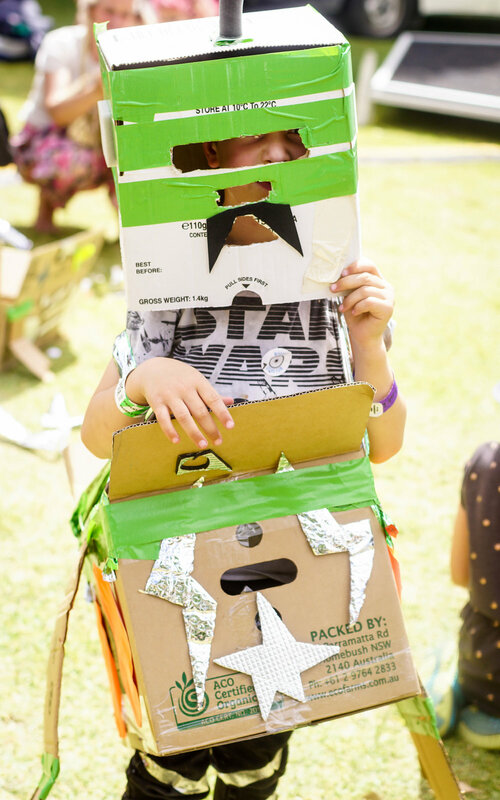 Box Car Races was developed for CoDesign Studio as part of Play Streets Australia.